Hey babes!! I'm sure you have all seen that I have joined the IDLife Team. And I want to explain why. Some of you may think, oh this is just another one of those annoying sales companies that only cares about profit and so on and so on...and let me tell you I understand why you might think that. There are so many scams out there who advertise, advertise, advertise, but the product is just not good. In fact, I was in one of them for about 2 weeks about a year ago and immediately got out because I didn't truly believe in what I was selling. But this is different. IDLife is based on the individual customer. They care so much about each individual person and even just starting, I feel the love and support of the people above me in the business. I'll get back to the business, but honestly, the products are a game changer in themselves. I HONESTLY CAN SAY they are the best on the market. And I wouldn't say that or represent them if I did not fully believe that. I have seen these products change people's lives. From weight loss, to athletic performance, to overall happiness, you name it. One of my leaders actually overcame arthritis through the use of the vitamins. With caring about the individual comes caring about the product. These products are organic, non GMO, all natural, no fillers or artificial sweeteners, and better yet.....they taste better than any product I have ever had. The core product of IDLife is the Nutrition, one of my personal favorites. These are vitamins customized to your needs. They take into consideration everything about you and give you the right combination. And the quality is amazing. They also come in convenient am and pm packs and are shipped monthly to your door. Most common vitamins don't even have what they say they do and are full of harmful fillers, but you can be sure you are truly giving your body the best with these. The rest of their product line ranges from sleep strips to healthy energy drinks to pre and post workout to protein to weight loss kits and more. It is truly a lifestyle company. They are all about providing solutions in order for you to live a better and healthier life. Now to the business side. And you may not even care about this at all! But it would be selfish not to share. The opportunity to make a very good income with this company is unbelievable. This is a fairly new MLM company, and with the product they have, NOW IS THE TIME to join. Because when it takes off, you want to be on board. The benefits are awesome. For instance, bonuses as you move up rankings, commissions, free product, etc. Now, you can't just sit there and expect it to work, but the plan they have set up is so simple. And if you follow it and are willing to share the product (which is a no brainier because it's amazzzzing), you will succeed. Even a couple hundred dollars a month is worth it to me, although with this company and the place it is at, there is potential for SO much more than that. So, all that being said....if you are interested in trying the product/hearing more about them (vitamins, weight loss kit, energy powder, etc.) or you are interested in joining my team and helping change people's lives with this company, comment your email below and I will send you more information. You can also go to my site live-better.idlife.com to order products if you already know you want to!! Customers can get 10% by putting products on auto ship which can be canceled or edited anytime. I will put a link here with an overview on all the products! Thanks for reading and hopefully you can tell I genuinely believe in this company. Can't wait to hopefully hear from some of you! 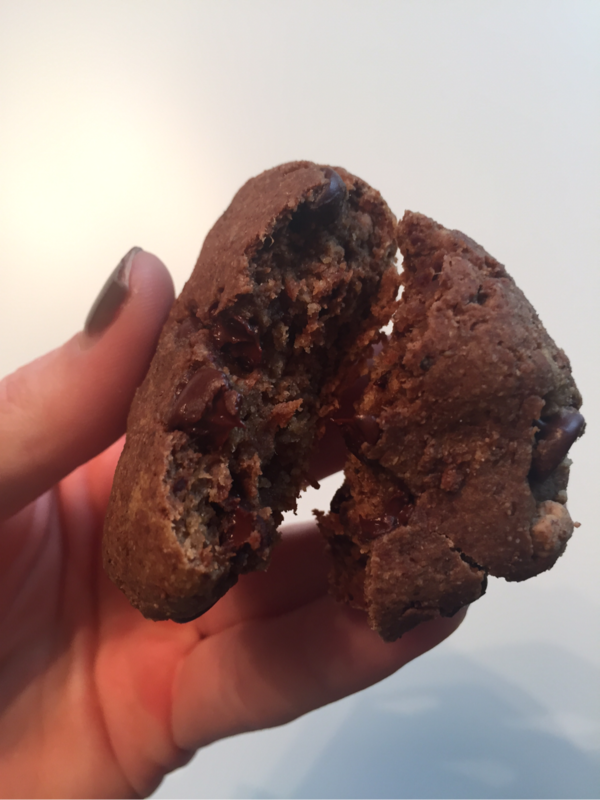 Goodbye Macros // Why I'm Making the Switch. If you follow my Instagram, you know I began tracking macros and got a coach to help me through a bulk and a cut. (disclaimer: all of my thoughts on my bulk are still very positive like I mentioned in my YouTube video) Throughout this bulk though, I started to watch and follow tons of girls who did the same thing. I got obsessed with being like them in a way. Using the same brands, eating all the bro foods, etc. The bulk was so good for me in that I put on MUCH NEEDED healthy fat and muscle and learned not to fear bigger numbers on labels and on the scale. But, I began to not be myself. I saw all these fitness girls who posted countless selfies and used all the popular supplement brands. Eventually, I stopped posting a lot of food because I thought it wasn't what 'they' did. I stopped doing yoga and added meat totally back into my diet. With that being said, I do not want to cut out meat again but I just wasn't as cautious of where it was coming from or how often I was eating it. I felt that eating plant based meals wasn't the bodybuilding thing to do, so I didn't..even though I firmly believe adopting more plants into your diet rather than meat at every meal is a great thing to do. I also started ignoring artificial sweeteners and things of that sort just to fit in with the brands, even though I have never stood for that. Basically, I was giving up what I loved and believed in to meet a standard. Truly I didn't even realize I had totally changed myself to be like 'other fitness girls' until just recently. When I realized that, I started to realize that I was also being consumed by macros. I thought it was some freeing way of being able to fit in certain foods, but that's just not the case for me. It keeps me from going out at times because I don't know the macros at restaurants. I have to constantly think about food again. I have to take out certain very healthy foods some days just because they don't fit my macros. I can't just freely cook,etc. (hence why I kind of stopped posting food pictures). So, my plan?? Well, since I did get a coach, I'm going to finish out this cut on my macros, or at least try to. I may even end it shorter than it was meant to be. But right after, I WILL BE JUST EATING. I don't even want to call it intuitive eating, just dang eating. Like A NORMAL HUMAN. I want to eat more plant based meals, a spoonful of peanut butter when I want, a huge bowl of nana ice cream when I want, and just fuel my body with all the clean eats. I want to support companies I stand for, not just a company with a big following. I will continue lifting because I absolutely love it!!! But I want to add in yoga again as well. I don't have to conform to any standard and there is no reason for me to track every gram I eat into a silly app. So, yep, those are my thoughts. Real talk lol no filter in this one. And I am not hating on anyone's lifestyle. I'm making this switch for myself. And I hope to show people everywhere that the health industry has truly manipulated our minds and it's really a very simple task to be healthy. ​I will keep you guys updated as I start this. I can't wait to just be ME, eat REAL FOOD, and LOVE LIFE. Thanks for reading babes. Comment below any thoughts as well as ideas for future blog posts. When it comes to Kombucha, I'm sure you may have some questions. I know I did! I'm gonna be super honest, the first booth I ever tried, I HATED. But then Clearly Kombucha sent me some samples, and what do you know? I loved them!! Their flavors are all so yummy and offer so many nutritional benefits. 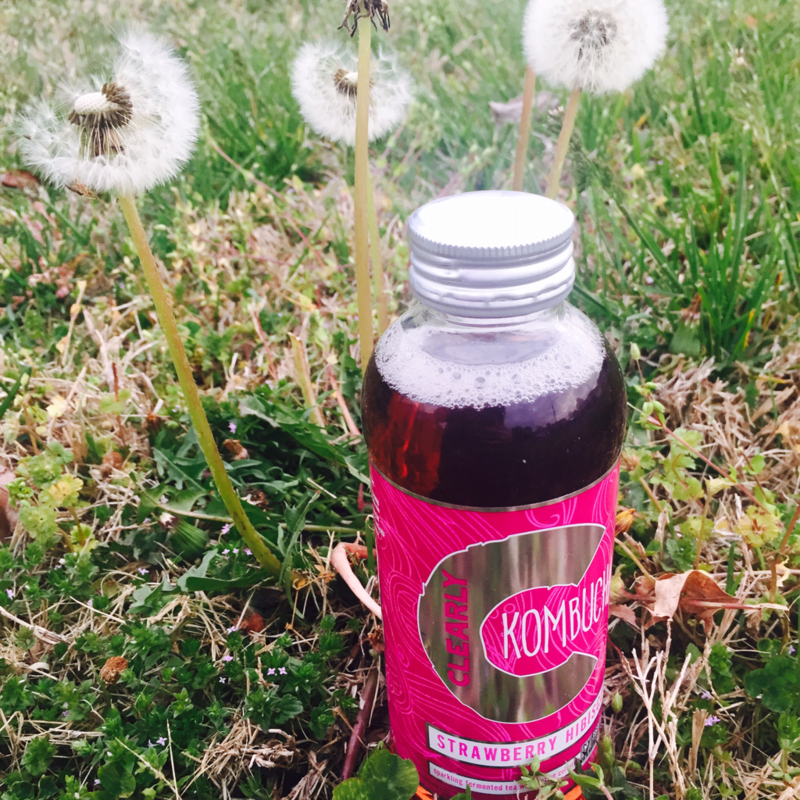 Keep reading to find out more about the hype on Booch and why I love CK. It's a fermented tea known for its many health benefits. These include improved gut health, improved digestion due to probiotics, strengthening the immune system, providing energy, and detoxifying the body. Why do I choose Clearly Kombucha? This is truly one of the only Kombucha brands I have liked. I actually enjoy the taste of their booch. They are able to offer a better flavor due to their unique filtration process after fermentation. They remove the leftover culture sediment leaving the healthy gut bacteria, which provides a light and fresh drink. To me, this is what really sets them apart from other Booch brands. This brand is also lower in sugar and calories than most other brands of Kombucha, but you don't miss out on the flavor. You can use Kombucha whenever you please! My favorite time to use it is for a mid afternoon pick me up after class to keep my energy up for the day. You can even make a yummy Sangria recipe at night with your hubby or boyfriend if you please :) Clearly Kombucha's website has more information on recipe and their product as well that you can check out here. Using this product is great in aiding with digestion and keeping your gut healthy. Hey guys, it's been a while! I have been so busy with school work that blogging hasn't really made it onto the agenda lately. I wish I had more time for it, but right now, Chemistry is just about all I do. But since I have been getting back into meal prep and packing my lunches for in-between classes, I thought I would do a quick post on some tips for that! Hope you enjoy. I am also collaborating on this post with two of my sweet friends. I will be posting links to their blogs with a preview to their post. Check them out for some more college prep ideas! 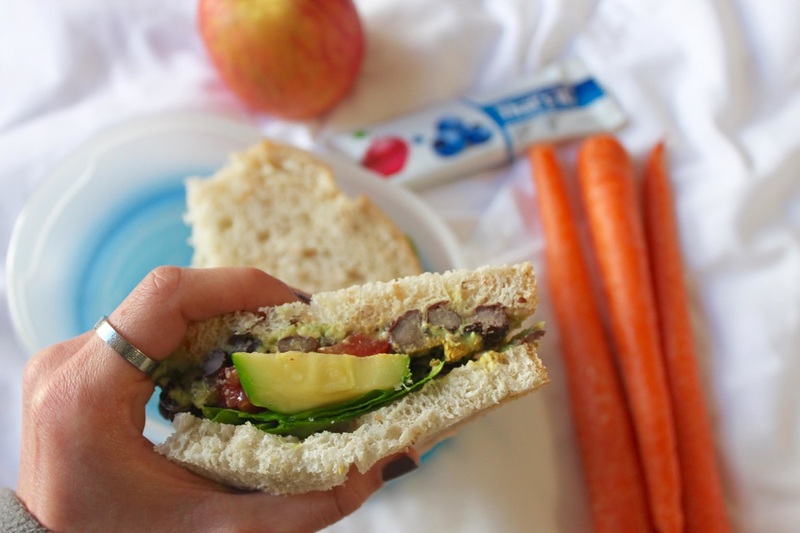 First, you might be wondering what to prep to have on hand to pack up quick on the go lunches! I always pick one or two whole grains, such as brown rice, quinoa, whole grain pasta. I always go ahead and rinse plenty of legumes for some good sources of plant protein. You could also prep chicken breasts to throw in as well. Lastly, I always pick a few veggies to roast and store for the week. Pictured here are roasted sweet potatoes and a mix of roasted green veggies. Now, What to Pack for Lunch? Here's my rule of thumb for what to pack: a balance of protein, healthy fats, and complex carbs. I will give a description of the above lunch below! I love this lunch because it is a great balance of complex carbs, healthy fats, and protein. The mixture of the brown rice and legumes gives you a complete protein source and keeps your hunger at bay throughout your day. The avocado also helps in keeping you full and giving your body those healthy brain fats that they need everyday, especially in school. You can always substitute the grain for a different grain or pick a different protein, but this is by far one of my favorite combinations. Quick, easy, and delicious! 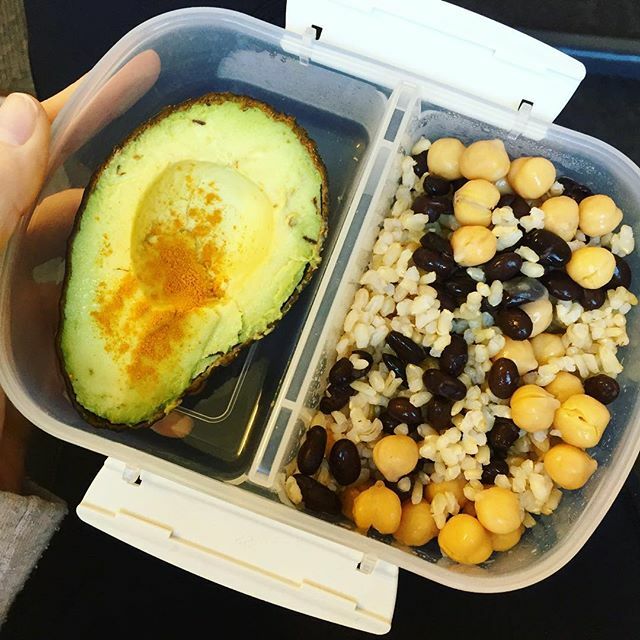 Below I will be linking some of my favorite bloggers and foodies so that you can check out their tips on how to survive packing school lunches as well :) Hopefully one day, I can have as good a blog as these two do. You want to check them out, trust me! 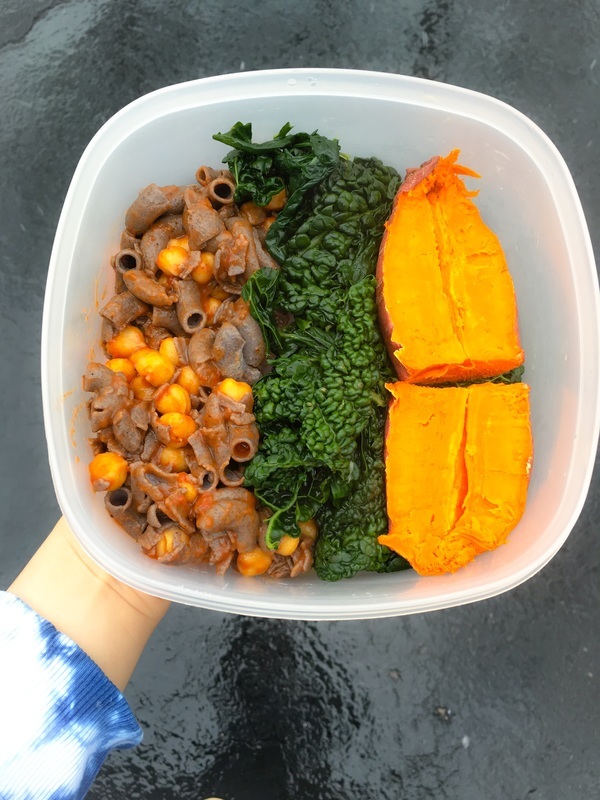 1/2 cup Black Bean & Quinoa Pasta 1/3 cup Garbanzo Beans 1/4 cup Marinara Sauce 1/2 Large Sweet Potato Steamed Kale I love this on the go lunch because it's easy to eat in between classes and it's super delicious. Black bean & quinoa pasta with garbanzo beans and marinara sauce is a delicious and easy combination to put together. Adding some sort of green is always a must in my lunches and I love steaming organic kale in vegetable broth! Sweet potatoes add substance and balance out the savory foods. I have one piece of fruit in addition to this, which usually happens to be a banana. This lunch is versatile too. You could swap out the pasta with brown rice or quinoa, and it would still taste awesome. If you're not a kale fan, swiss chard would be super yummy! Same with the sweet potato, you could definitely opt for a russet potato, perhaps with a little guac on top. Thanks for reading! 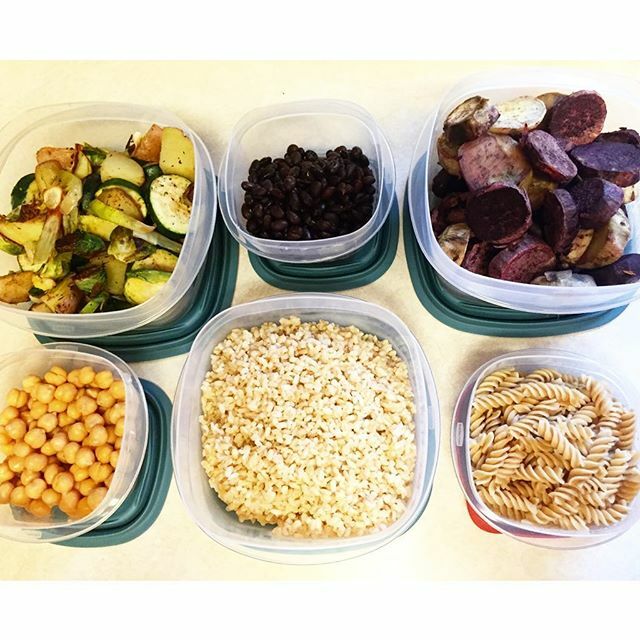 We are so excited about this post and really hope it helps you guys get an idea of how to prep and pack healthy on the go lunches. I can't believe I'm sipping on my last juice of my three day cleanse right now!!! On day one, I never thought it would end..but I ended up loving it!! If you read yesterday's post, today was pretty similar. I feel totally normal (no lightheadedness, etc.) and I'm super content! I did crave food today more so than yesterday, but I think it's because I know tomorrow..I get to eat!!!!! My goal is to not go immediately have a cheat night (really just because my body would probably hate me) and keep incorporating lots of whole, plant based foods as the majority of my diet. But no promises on that cheat night..I'll try to hold off a few days for my stomach ;) Balance is key, remember that!! So, since today was basically just like yesterday (other than maybe I don't think I could drink juice forever lol I would like food now), I'll just move into some final thoughts! 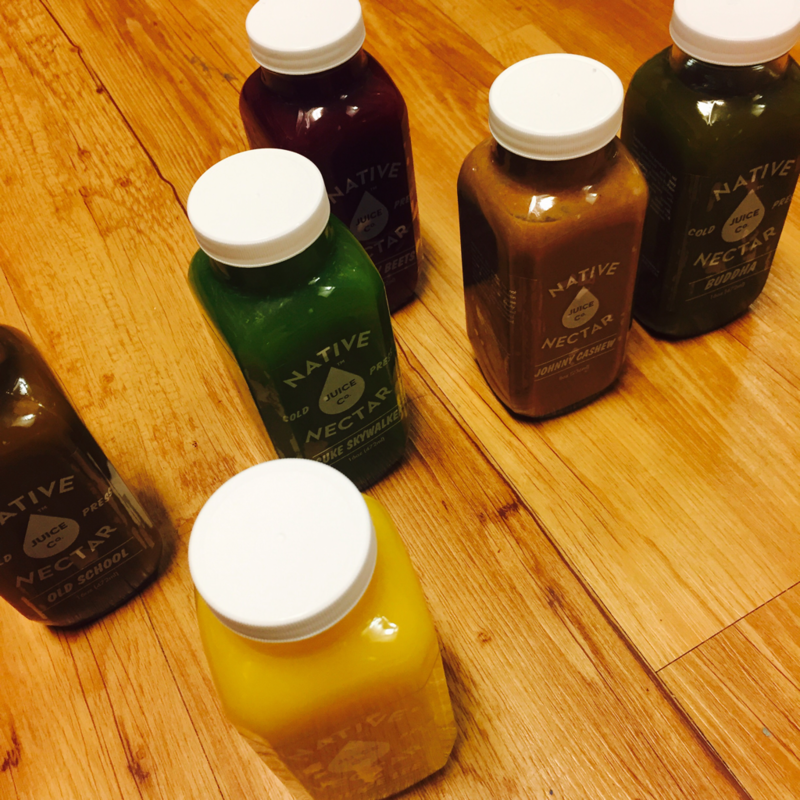 If you have ever thought about doing a juice cleanse, I'd say 100% do it!!! If it's for the right reasons. I don't encourage things like this for weight loss, etc. as I think any maintainable and healthy weight loss should take time. But with that being said, if you want to just see how you feel or want to do it to help you begin a more whole foods diet, go for it!! The first day is HARD, but push through it and I promise it will be worth it!! I feel so refreshed and have had zero stomach issues these past few days. And I'm just proud of myself for sticking with it! Also, my skin actually did clear up quite a bit!! Ohhh also...a major misconception I had was that I would be hungry...no, just the opposite. I was so full, I ended up doing only 5 a day and even that felt like a alot. Of course, I was also drinking a gallon of water each day! This cleanse made me more aware of my hunger cues as well. A lot of times, I'm not even hungry..I just want to eat! I'm going to make an effort to eat more based on my hunger from now on. Okay well that's all! Thank you for following my journey and I hope I helped anyone thinking about a cleanse want to follow through! Hey there! Day two is over with and I actually can't believe how I'm feeling! Yesterday, I wanted to give up and honestly thought this was going to be the longest three days of my life. But, turns out, today was amazing and flew by with no issues. The way I feel right now, I could juice for a whole week! Keep reading below for more details!! And check out these gorgeous juices...so yummy and so pretty! 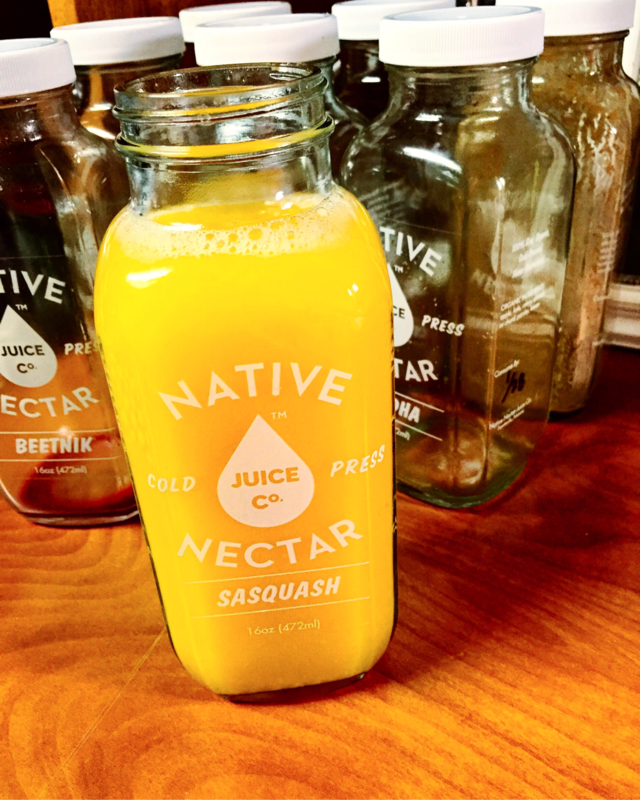 I mean, it doesn't get much better than butternut squash and cinnamon in a juice. Okay so a recap of yesterday...I was not feeling myself at all. I felt a little sick, light headed, out of it, and I was craving every bad food I could think of. Overnight, apparently my body did a 360! I know now those feelings yesterday were just my body detoxing. I woke up feeling great and ready to get my day going. I have not had ANY of these symptoms today and honestly I have so much mental clarity and energy. Now, I still feel too weak to do an intense workout as I'm not getting much protein, but I did squeeze in a quick yoga sesh in my dorm room! I am so content with everything and can honestly say...I don't have any cravings right now. I'm actually super excited for day three. Like yesterday, I stuck with 5 juices today! You would be shocked at how full you will be. I have not felt hungry ONCE this whole time so far. Yesterday, I wanted food, but not because I was hungry. I just wanted food! Which leads me to something else I have realized today! Our minds get so caught up in food and what we can and can't have or when we are going to eat, etc. Not being able to eat solid foods has truly made me rethink how I view food. It is a tool to fuel our bodies. When we are hungry and with however much we may need. Of course, I'm not saying don't go on some splurge cheat nights, but this has made me realize I probably think about these things way too often when that isn't what matters at all!! Overall, today has been an AMAZING day!! The only negative is honestly how much I have to pee...but hey, it's clear as water! 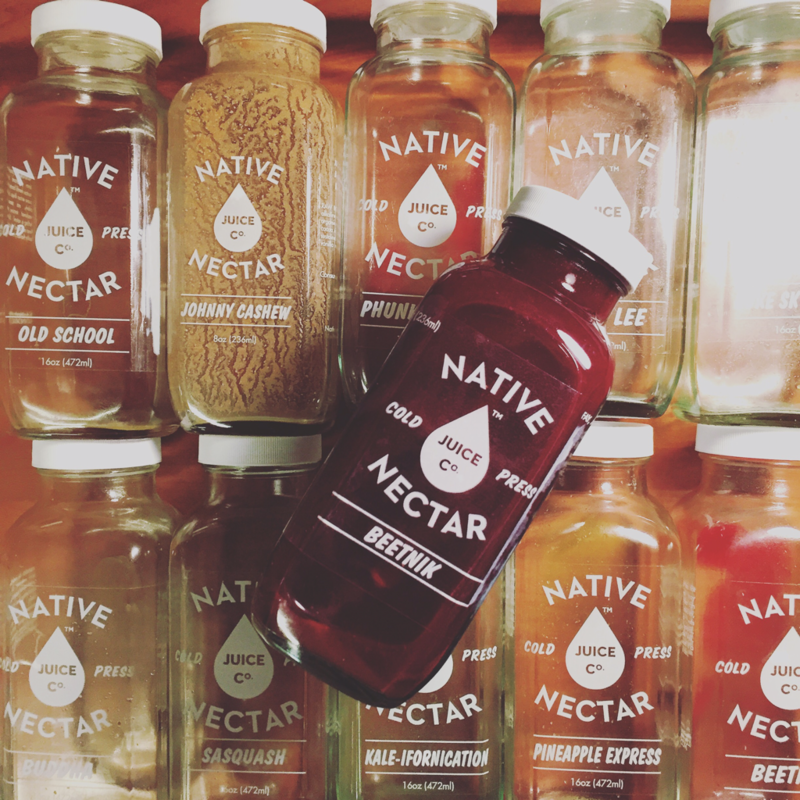 Also, just a quick side note about this particular juice cleanse through Native Nectar! I love how I get to add one nut milk. I have been drinking mine at the end of my day and it is like dessert...so good!!! It also has a creamier texture which is a nice change. If you didn't see my last post, I'll give you a few other reasons why I love this company and chose to do this cleanse. 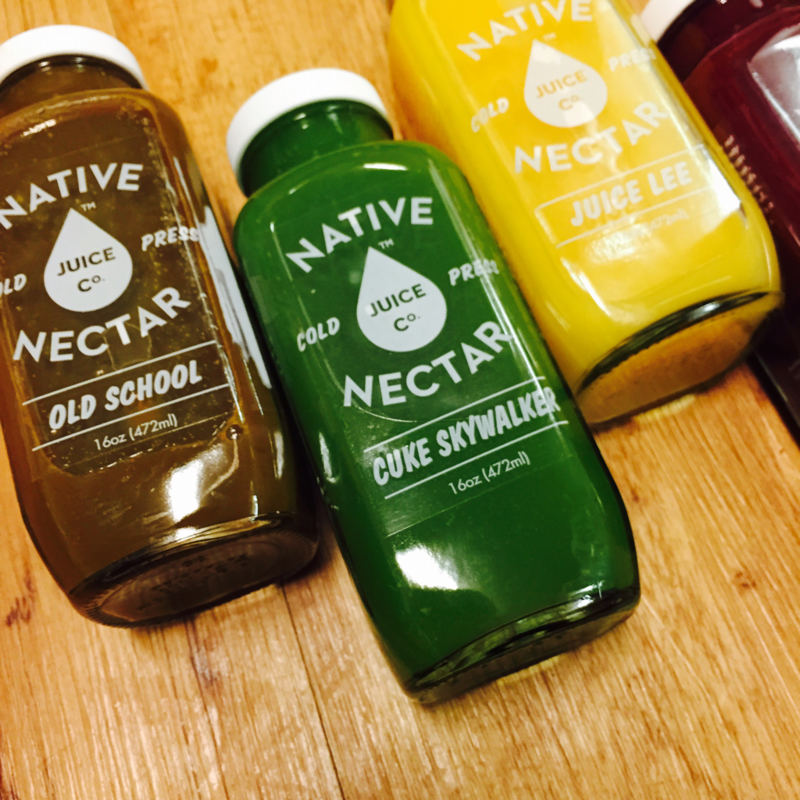 All of their juices are cold pressed and have 3+ pounds of organic produce. You can't find that in most juices. I love knowing that with these juices, I am not being deprived, but am flooding my body with nutrients. After today, I can already tell I would highly recommend anyone who is wanting a kick start to adding in more whole foods to their diet or just wants to give their digestive system a break, give this a try! I am so so glad I pushed through the first day! Can't wait to share my final thoughts tomorrow :) Happy juicing! 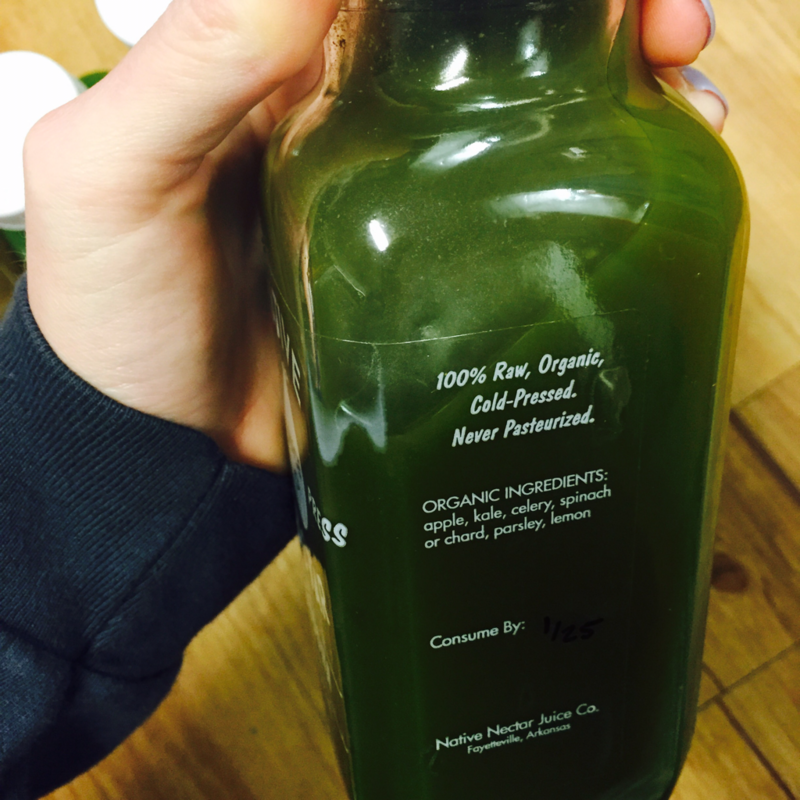 I am so excited to share my experience on this juice cleanse with you guys! I am doing it through the company Native Nectar. Click on the highlighted word to go to their website where you can learn all about the juices and cleanses they offer. First, I want to start by explaining why I am even doing this in the first place and what I will be doing! I chose to do the 3 day cleanse, and I will be drinking 5 juices and 1 nut milk each day. The juices are mix of all veggie and some fruit/veggie juices. Other than water, this will be all I consume over the next three days. I will also be aiming for 1 gallon of water a day!!! I won't be doing any intense exercise...maybe some yoga or walking, but nothing more if I do anything. Okay, onto why I'm doing this! About a year and a half ago me and my mom decided we wanted to do this 2 day smoothie cleanse and let me tell you, it was a fail. But, the smoothies were so gross that they were impossible to get down and we really weren't getting much in them. So, yeah, we may have quit mid way through the third smoothie. 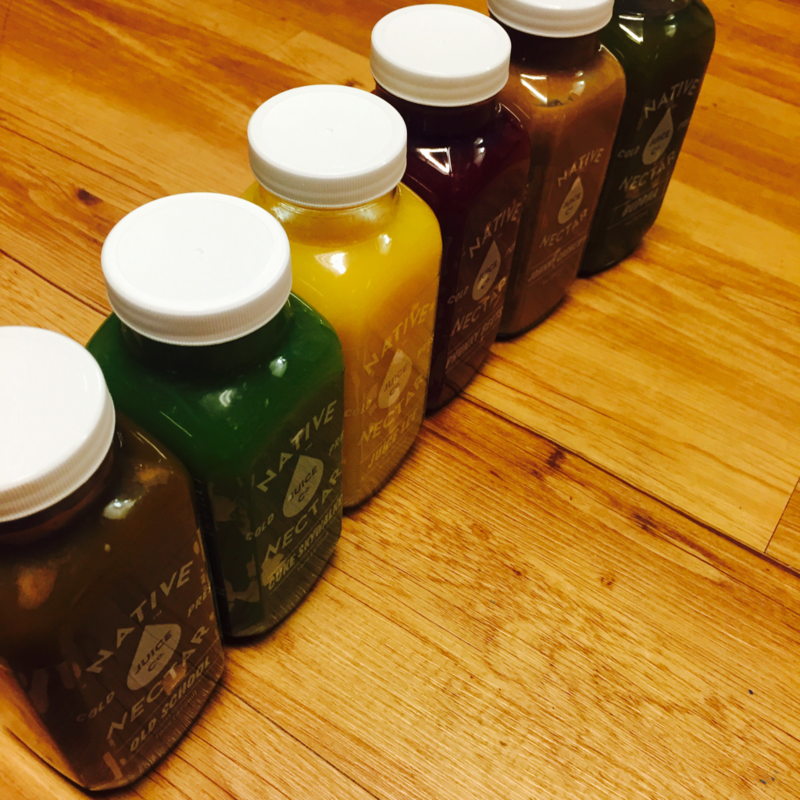 Ever since then, I have wanted to try a real, GOOD juice cleanse. 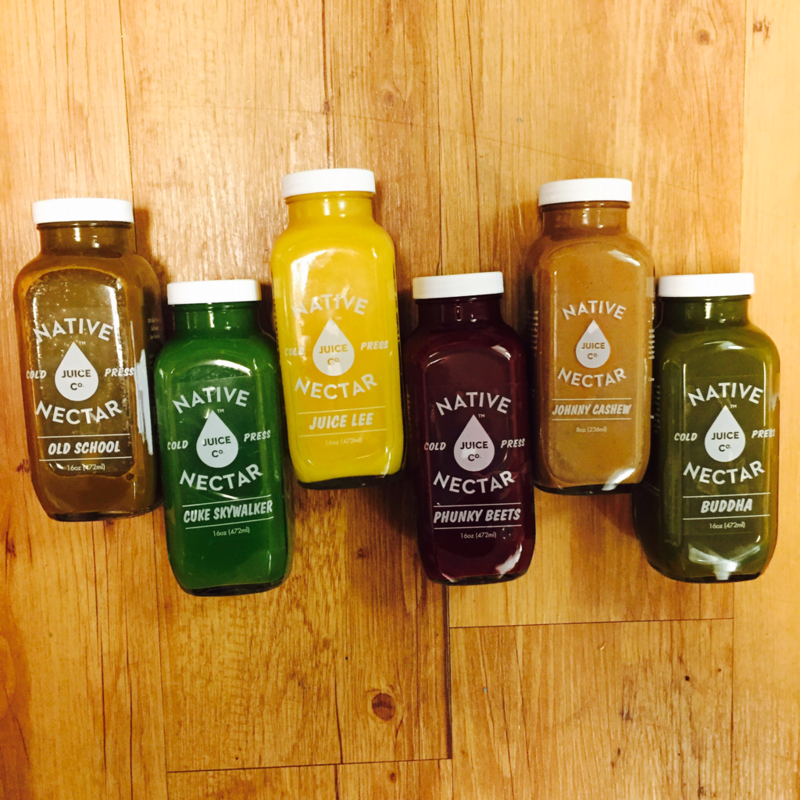 I know I love the taste of these juices and I know they will be providing me with tons and tons of nutrients. Actually, over the next three days, I will be drinking over 50 pounds of raw, organic produce!!!! Wow! And, to clear things up, this is not for weight loss, and I do not recommend quick fixes, such as cleansing/detoxing, for weight loss. 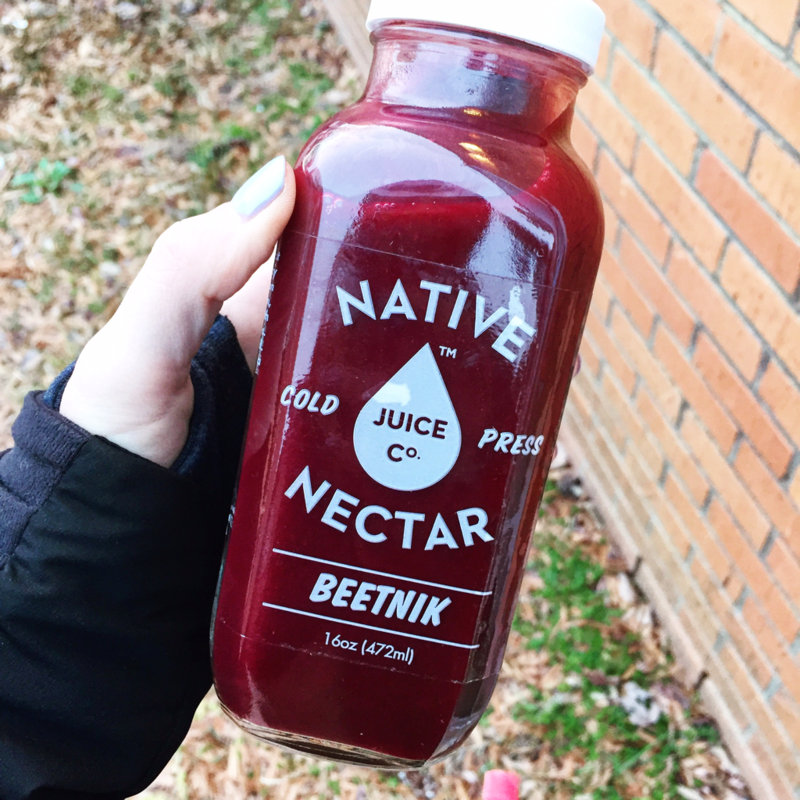 This is simply something I am very interested in trying out as I have heard many differing opinions on juice cleanses. I love challenging myself, and I think this is a great way for me to do it. Coming from an eating disorder in the past, food is something that has always been at the forefront of my mind. Even if not in a bad way now, food consumes a lot of my thoughts. What I want to make next, what I haven't had this week, or just the thought of food in general! Instead, over the next three days, I am going to use this time to truly appreciate my life and everything I have been blessed with. I won't be doing any intense exercise, which I think will be challenging for me as well, as I love exercising almost everyday. But my body needs to have a break sometimes! 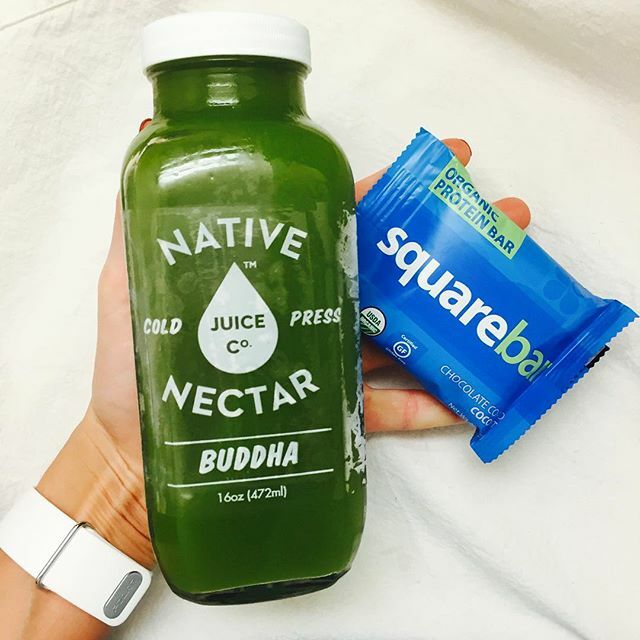 I think this cleanse will really challenge me to view food in a new way. I know food is here to fuel us, but sometimes I take advantage of that. I hope that this cleanse makes me really appreciate the food God has put on this earth to nourish our bodies. I also think it will make me thankful for having the access to good, whole foods when I want them here in this country. Not only am I doing this to challenge myself, but I am just curious as to how I will feel! I am going to be totally detoxing my body and giving my digestive system a 3 day rest! Obviously, I'm expecting to be hungry or to want to eat something, and I'm going to be totally honest about those feelings as well. But, I'm hoping that as I go, it will get easier and I will feel and see the effects of the nutrients that I have been flooding my body with. Oh, and lastly, look at these bottles!!! It's true, pretty things taste better and are way more fun to eat (or drink in this case). Day 1 thoughts will be below the pictures!!! I wrote all of the above the morning of Day 1, so the rest of my thoughts will be after experiencing a full day of juice cleansing. It's January. And for me, that means back at school. Since I'm a freshman, I really just have to rely on my microwave in my dorm. And let's just say this recipe is saving my life. It can be hard to eat clean and avoid junk food when you are always surrounded by it. 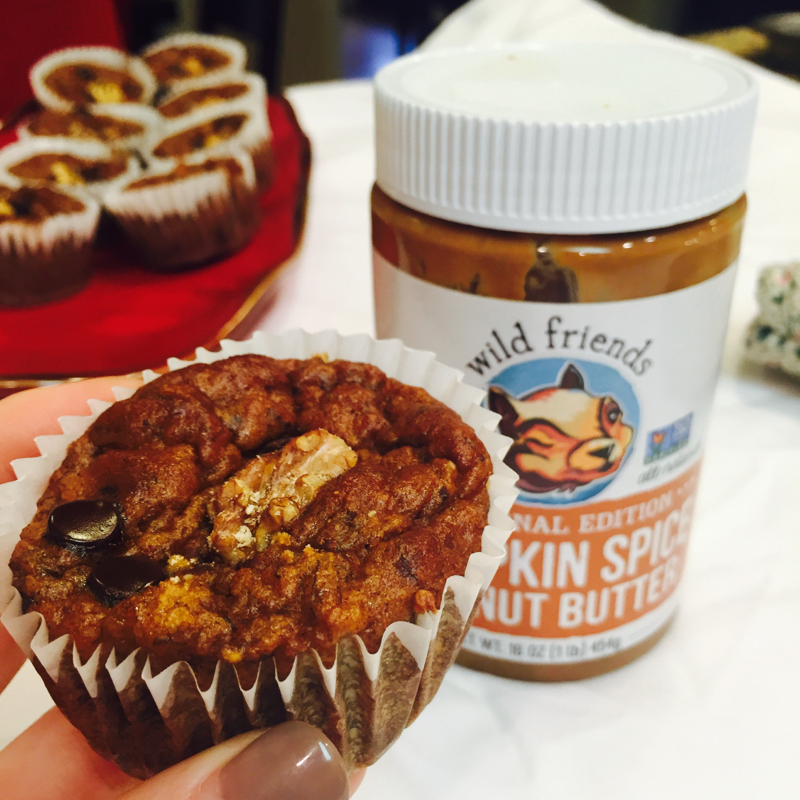 This is my go to for a healthy sweet treat that tastes just as good as the real thing. Plus, it's gluten free and vegan friendly! In a bowl, mix all ingredients together with a fork. Be sure it is mixed all the way through. You may have to stir for a while. Let cool slightly, then transfer to a plate with toppings or just eat it straight out of the mug!! Hey, hey! If you follow my Instagram, you know I can rant. I am all for being open and honest and speaking my mind. I've been through a lot of changes lately, and not necessarily bad ones. I have learned a lot about myself and about how I feel my best. With the positives though, there were some struggles. And that's totally okay! Sometimes we have to struggle to come out a better person. And I want to share some random thoughts on these things so that hopefully I can help anyone else going through a similar situation. This post will basically just be my random thoughts in no organized order. (hence the title!!) I'm just gonna be real and share what comes to my head when it comes! I thought doing some of these non traditional blog posts occasionally from now on would be fun. What do you guys think? Just for a head's up of what I'll be...ranting on? I guess you could call it that. Well, I'm going to be talking about my transition from clean eater (still ate lots of animal products), to trying out a more plant based diet, to wanting a title, to where I am now- TITLE FREE!!!. So, a few months ago, I had never even looked into eating a plant based diet. I had always eaten meat and had no plans of cutting it out. I began to see more and more about how taking on a more plant based lifestyle could have countless numbers of benefits not only to our health, but to the environment. 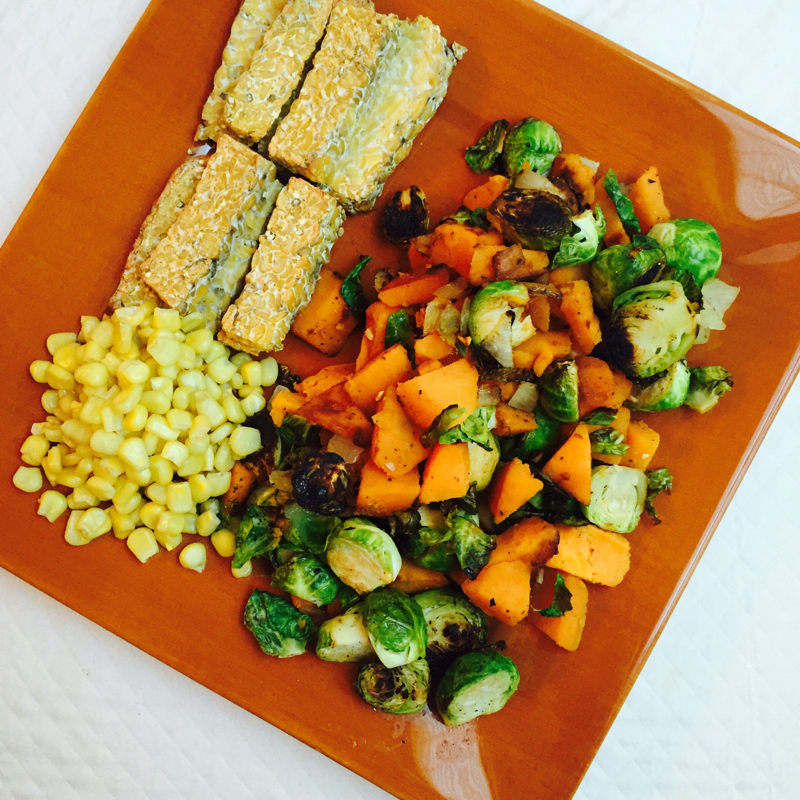 I began trying to make a few of my meals meatless, but I was overwhelmed with how to do it for a while. The more I did it, the more I loved it. 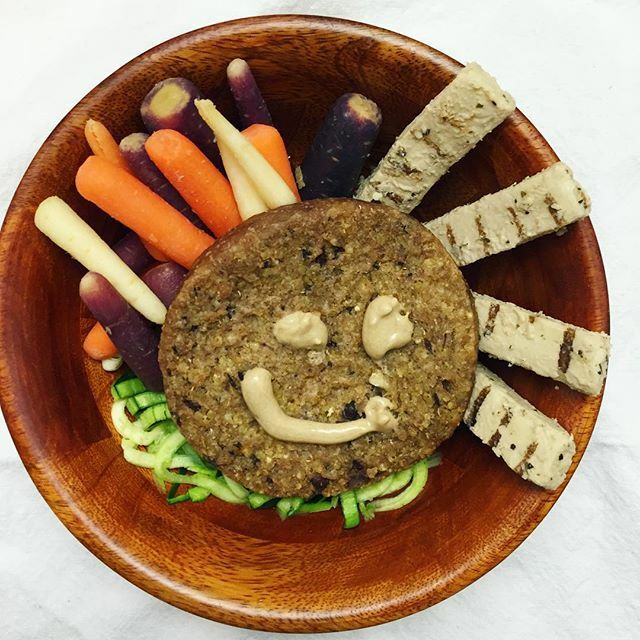 I loved getting creative with the countless varieties of plant based options God has provided to this world. I was also getting to eat more than I ever had. (SCORE!) I probably ate animal products 1-2x daily at this point. Recently, I watched a few different documentaries, and this made me really want to just call myself 100% plant based vegan. (Forks over Knives & Cowspiracy are the two that influenced me the most- I would highly suggest watching them, but still keep in mind, you don't have to go all or nothing- take this post as an example) The days following this, I was obsessed with picking a title for myself. I went back and forth from "Vegan" to "plant based w/occasional animal products". I couldn't decide what I wanted to do. I felt guilty when I thought I wanted ice cream or eggs. It began to take over my head. I wanted a title so bad for some reason. I put plant based in my bio on Instagram (this has been changed now obvi) and thought I would feel better. Well, I didn't. I still was no better than anyone else without a title and only felt restricted and felt I didn't have a balance anymore by giving myself this title. I saw a few posts from people who have recently become title free, and really started to evaluate my own life. I prayed about it and came to the decision that I had taken this too far. I don't need a title. Not vegan, not plant based, not plant based with occasion animal products, not dairy free, not ANYTHING!! TITLE FREE. I can still have my values and my opinions without putting a title on them. I can still encourage people to live a more plant based lifestyle without feeling like I have to be all or nothing. I am not any more human by titling the way I eat. I still eat either way. All the title does is give me rules. Which is not balance. I want to feel my best and I want to be happy, and no title can do this for me. Let's not look for our identity in food. (remember- your identity is in God!!! He made you and loves you for you, not for your earthly titles) You are you no matter what so why give yourself rules? Enjoy your life, be happy, and be YOU!! Since switching to a plant based diet, I thought it was going to be harder to satisfy my sweet tooth. But, I now have no question in my mind that you can. And...it's so easy!! 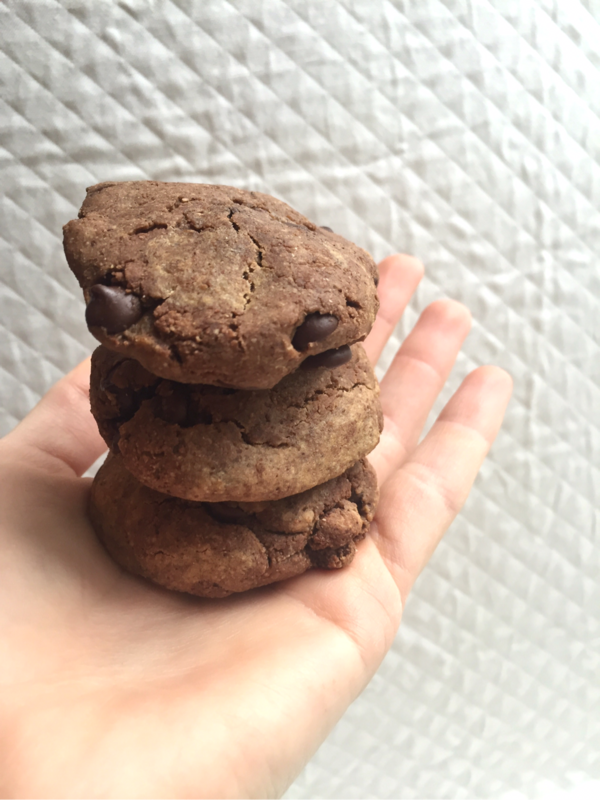 These vegan chewy cookies are so good. I can honestly say they are better than the ones I grew up on. And with no guilt? I'll take the whole tray! These are also gluten and soy free. Perfect to bake for your family and your friends. Give them a try! Would love reviews as well. Here's a few mouth watering pictures of these delicious sweet morsels. Okay, if those pictures didn't make you want to make these, I don't know what will! Keep reading for the recipe. In a mixer, mix together almond butter, apple sauce, flaxseed, coconut sugar, stevia, and vanilla. Once smooth, mix in oat flour, baking soda, and salt. 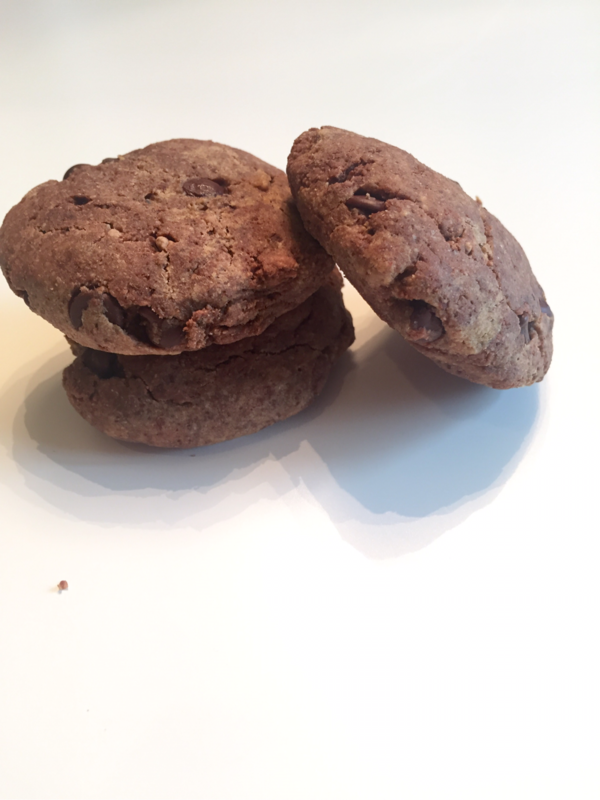 Add in remaining ingredients - gluten free baking flour, chocolate chips, and cocoa powder. 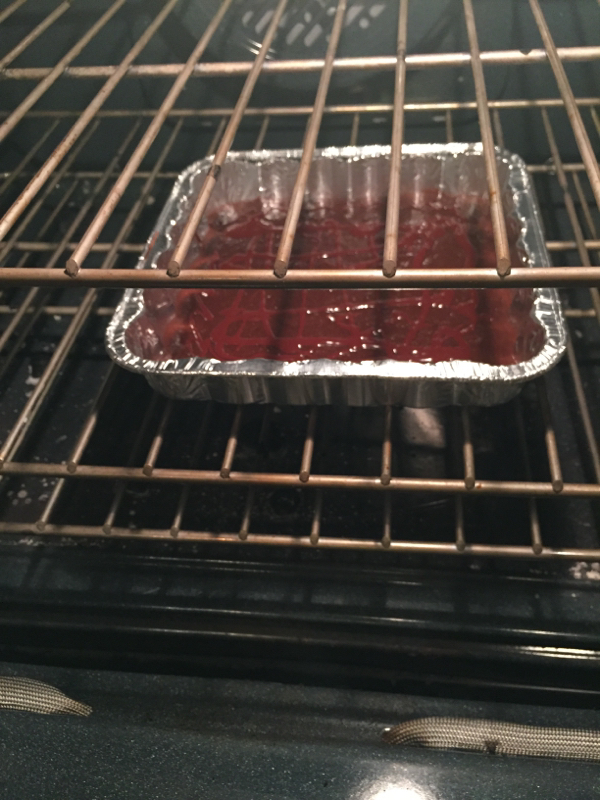 Spray a cookie sheet with coconut oil or olive oil non stick cooking spray. Roll dough into small balls and flatten slightly until about the size of a small cookie. Bake at 350 for 9 minutes. Remove and let cool for about 5 minutes, then enjoy! 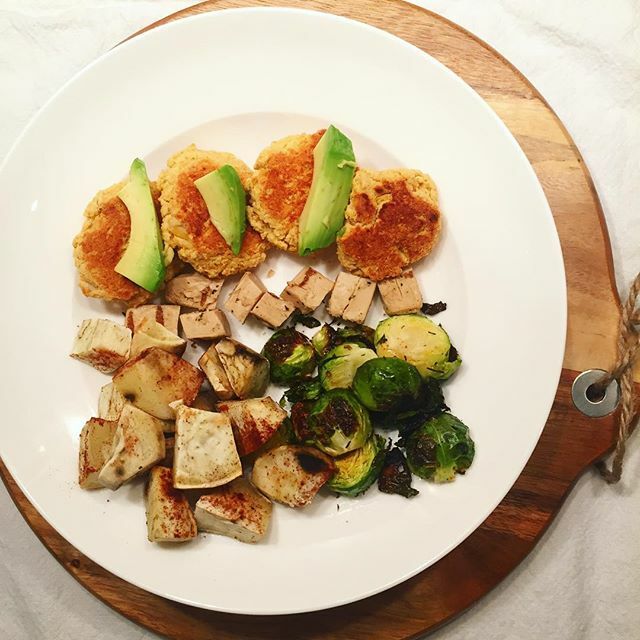 Be sure to check out my Instagram @syd_healthynfit for more recipes! What is plant-based all about? Plant-based. It's something you may hear about all too often without knowing what it really means or why people do it. A few months ago, saying I lived a mainly plant-based lifestyle would have sounded CRAZY to me. But guess what? I absolutely love it!!! Being plant-based for me means that the majority of my diet comes from fresh vegetables, fruits, nuts, and whole grains. Where's the protein you might ask? Protein can be found in a wide variety of plant-based foods, such as: quinoa, chia seeds, nuts, tempeh, legumes, pea protein powder, oats, and even kale. Keep reading to learn about my journey from eating animal products at basically every meal to eating them just a few times a week. I will also talk about why I choose not to give myself a strict 100% plant-based/vegan title. When I began this plant-based lifestyle, I was very tempted to just say I wanted to be 100% vegan and never eat anything from an animal again. But after some thought, I realized this was neither healthy for me nor was there really a point in doing so. I have a past of disorder/restriction with food, and giving myself strict limits like this would only bring back old habits that I promised to myself I would never return to. There is no joy in living that way. I absolutely LOVE salmon, eggs, and frozen yogurt. So why would I tell myself I could never have these again? In the end, eating majority plant-based will still give you so many benefits. Some fish or yogurt here and there won't take away from these benefits and honestly, won't hurt you at all! I, personally, just FEEL better sticking to an overall plant-based diet. (side note- I buy my meats wild caught/free range & try to get my yogurt grass fed) Also, I believe that everyone is different. Some people can thrive on a plant-based diet, while some may feel better and be happier enjoying some meat each day. I'm not here to judge those who do eat animal products for the majority of their diet. I just want to share my experience with cutting out the majority of it and tell why I love it so much. Since about two years ago, I have dealt with bad skin, stomach pain almost nightly, digestion issues, and an overall lack of energy. I did not understand why this was happening. I had tried every face wash out there and had been to multiple doctors about my stomach issues. I couldn't get any answers and I was tired of feeling the way I did. I had seen a lot on people who's lives changed on a plant-based diet, so I thought why not try? Maybe it will clear up my skin and I won't have to lay in bed with a heating pad to ease my stomach pain every night. I knew dairy made me a little sick already when I chose to eat it, but why did I have these issues all the time...? Well, I am here to tell you that this diet change has changed my life. I would say I have some form of meat, dairy, etc. about once or twice a week. When I crave it, I do not restrict myself. But the way I feel with this new lifestyle, the cravings really don't come often. So, what has changed? Well, my skin is almost completely cleared up. I will have random breakouts occasionally, but nothing like how they were. My digestion is so much better. I have so much more energy. I used to drink coffee every morning and take a nap almost daily. I haven't had coffee in about a month and never feel the need to nap. I have also been sleeping through the night and waking up feeling refreshed and energized. And yes, plants can fuel me through difficult workouts, as this is a common misconception I would like to clear up. One of my biggest changes has been with my stomach pain, especially over the past 3 weeks. It had gotten much, much better just from having a majority plant-based diet, but now it's going extremely well. I have really limited my gluten and soy intake these past few weeks, and have had almost NO pain. I believe I may be slightly intolerant to the two, so I plan to eat them in moderation in order to feel my best. It's amazing not having pain every night that keeps me awake. I'm not saying you need to cut out soy and gluten too..this has just helped me even more due to some intolerances. The benefits I had even before this were something I would have never thought possible just from changing my diet to plant-based. I'm not saying you have to make the switch or you aren't healthy if you don't, but I do encourage everyone to give it a try! Even if that's just changing one of your meals each day. See what it does for you. It's worth the try, take it from me! It's a New Year. What does that mean? Resolutions. 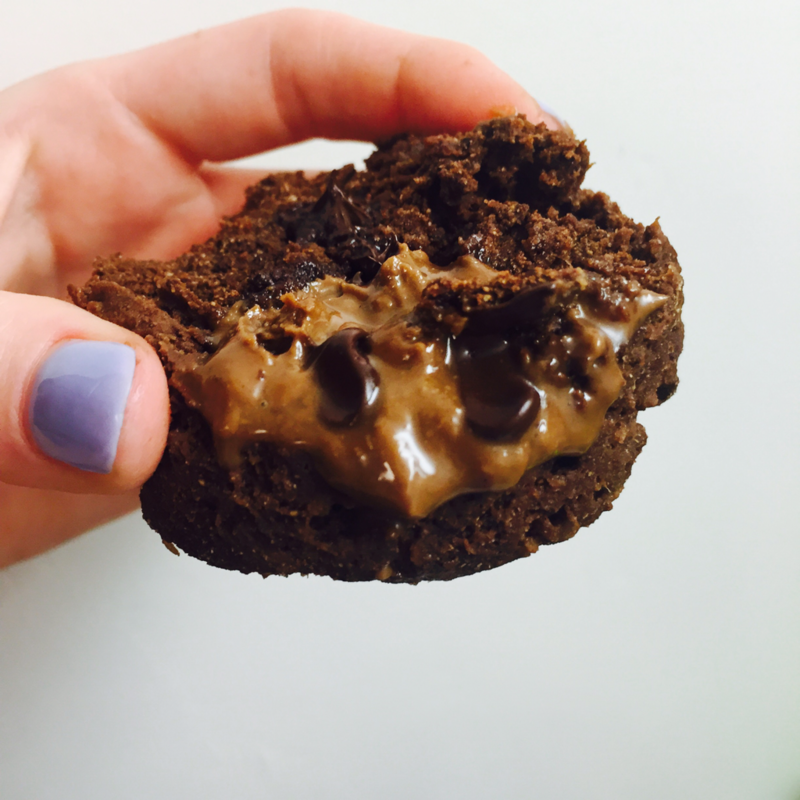 If one of yours is to clean up your diet and get in shape, these are the brownies for you! Vegan friendly, gluten free, and soy free. 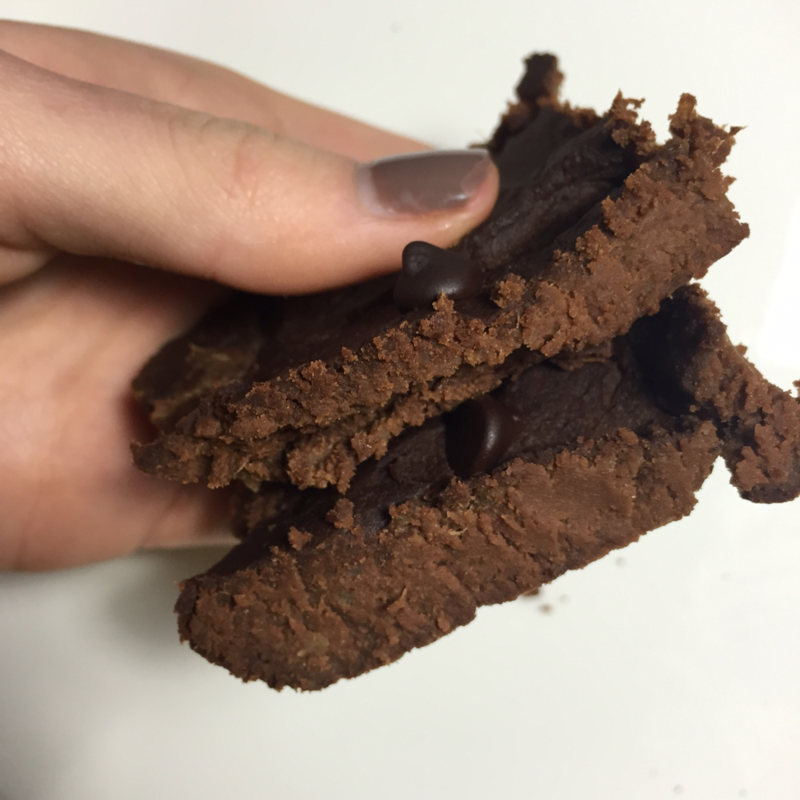 You'll actually sneak in a veggie serving with these brownies! The method for making these is very important for them to work, so try to follow it as closely as possible. Enjoy! Stab Sweet potato with a sharp knife and wrap in foil. Bake in the oven at 400 for about an hour. While the potato is still hot (be sure it is very soft), peel and transfer into a mixing bowl. Add in water and mix together until smooth. Immediately add in all other ingredients except for chocolate chips and mix until combined. 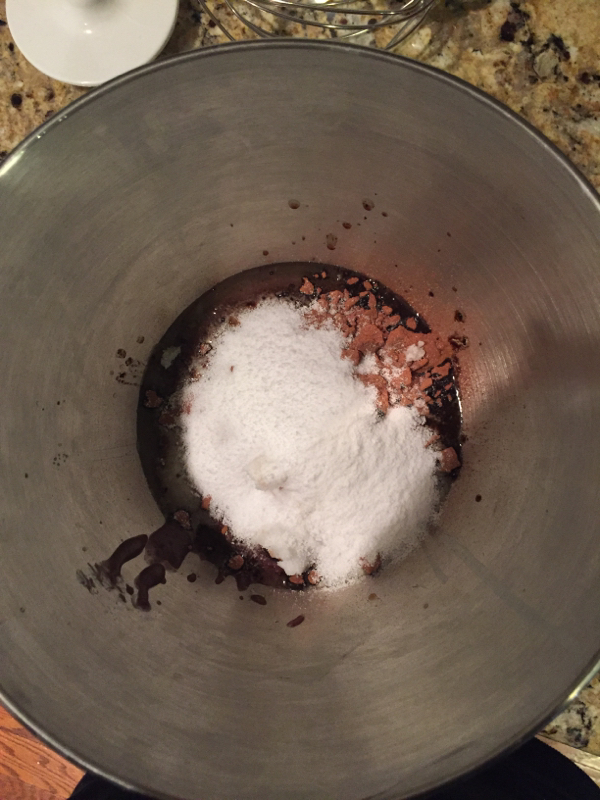 Add chocolate chips at the very end of mixing. Spray small baking pan with coconut oil spray, then transfer all batter into pan. Press down to fill the pan. Top with a few more chocolate chips. Being home from school for break, one of the first things I had to make were my yummy clean eating pancakes. Minimal ingredients, but absolutely no flavor lost! Pancakes are something I have always loved and it took a while to find a good healthy recipe for them that didn't fall apart or taste like chalk. But this one takes the cake! Or well, the pancake. 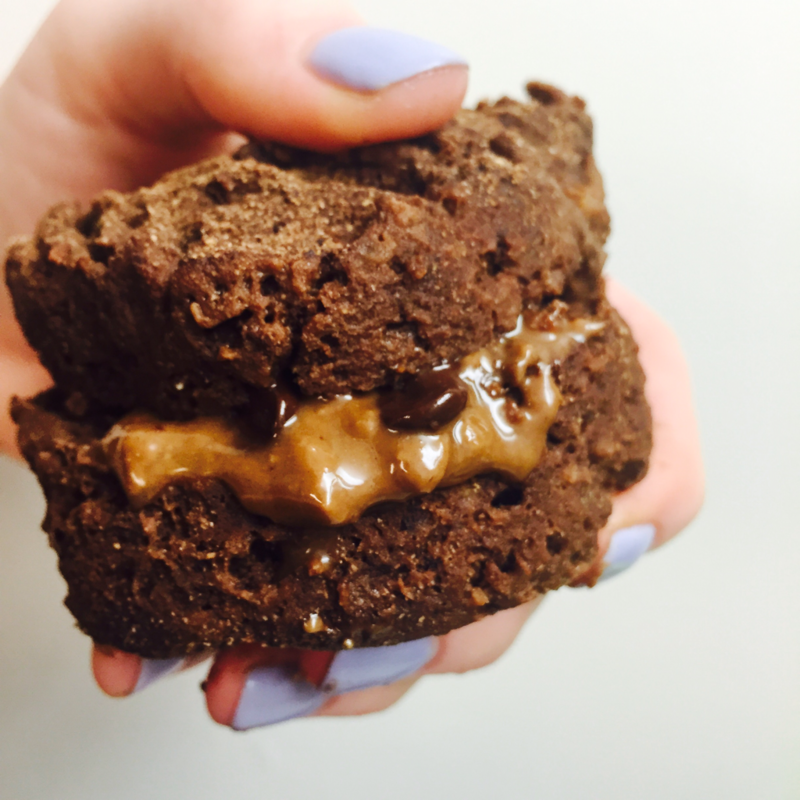 This recipe is vegan and gluten free as well! ​1 scoop Nuzest cappuccino protein powder (use my code, inspiredbysydney, for 15% off at checkout) You can replace this with another powder, but I would highly suggest this one. Has no chalky flavor to it whatsoever and the ingredients are as good as you can get. Also, one of the few plant protein powders that provides all 9 essential amino acids necessary for muscle growth. Combine all ingredients in a blender except for the chocolate chips. Once blended, stir in the chocolate chips. Heat a griddle on your stove top. Once hot, spray with non stick spray and pour batter into small circles. Flip when they begin to bubble on top, then let cook about another minute. Respray the griddle between pancakes to avoid sticking. Top with whatever you like. 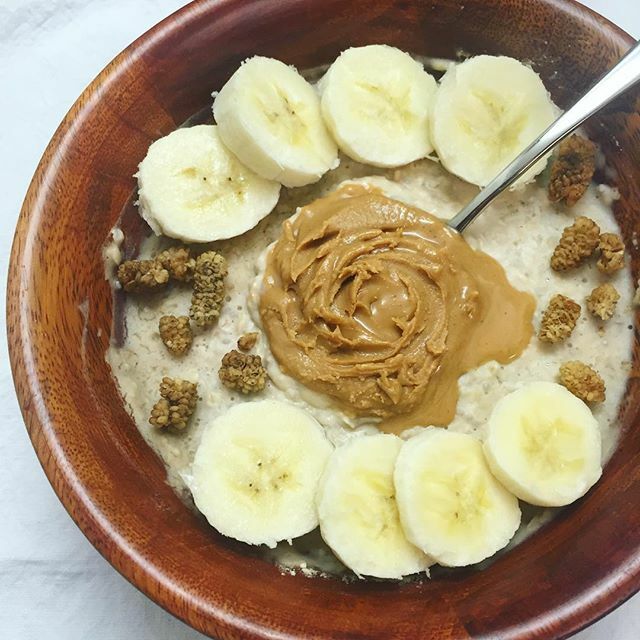 I love topping mine with peanut butter, honey, and banana! Yum yum..falafels. One of my all time favorite plant based meal options! SO SO good and packed with protein and healthy fats. A lot of falafel available at restaurants is fried, but this baked version tastes just as good, if not better!! So easy too! In a large food processor, combine all ingredients except for the kale until all mixed. Add kale to food processor and give a quick spin just to break it up a little bit and mix it throughout. 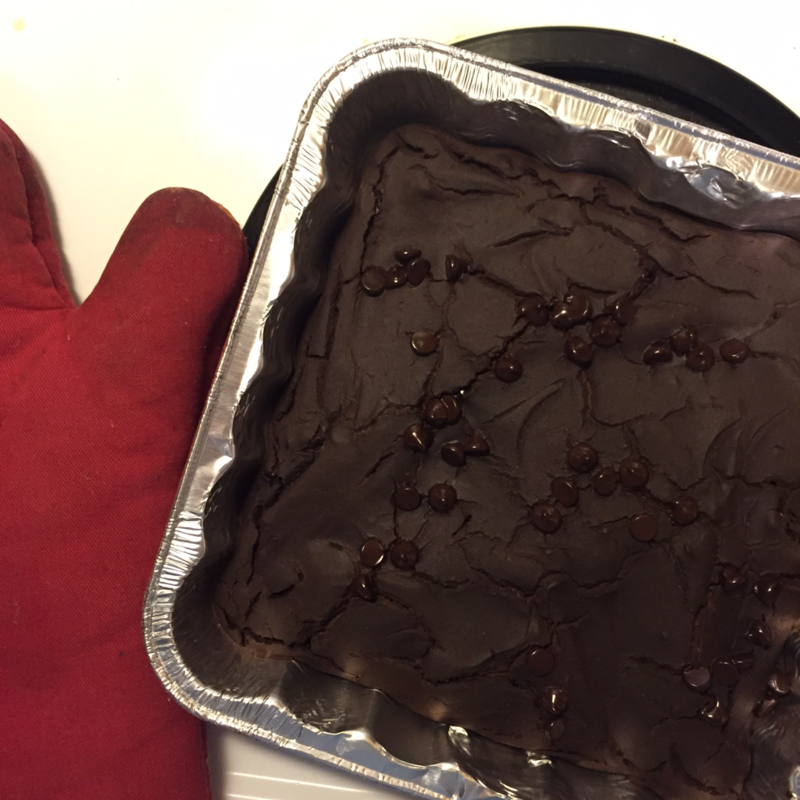 Spray cookie sheet with non stick spray. Make mixture into small round patties and place on baking sheet. Bake at 375 for 20 minutes. Remove, flip, and bake for an additional 10 minutes. Now serve however you like! They are amazing on their own, but I also love putting them in wraps too! I had my first Christmas event tonight, and we all know what that means. Lots and lots of unhealthy sides and sweets. 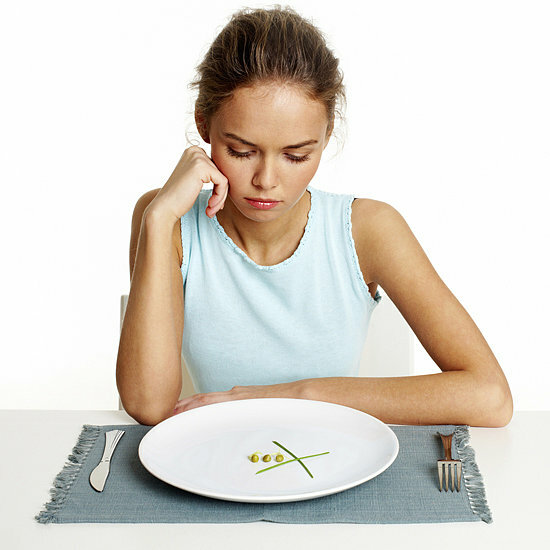 It can be overwhelming for someone who is trying to have a healthier eating lifestyle during these times. For me, I honestly don't even get tempted by the treats anymore because I know how I feel after I eat them. Not to say I won't have the occasional treat, but some nights you just don't want to "cheat". For this reason, I love bringing my own healthy options to events like this. Like these bliss balls for example. Not only are they so yummy (trust me, people didn't even know they were healthy) and 100% clean, but they are gorgeous on the dessert table!! And there are endless combinations. Oh, AND, they are so easy!! Below are the recipes of the combinations I made for my first holiday event! Let the Christmas festivities begin. 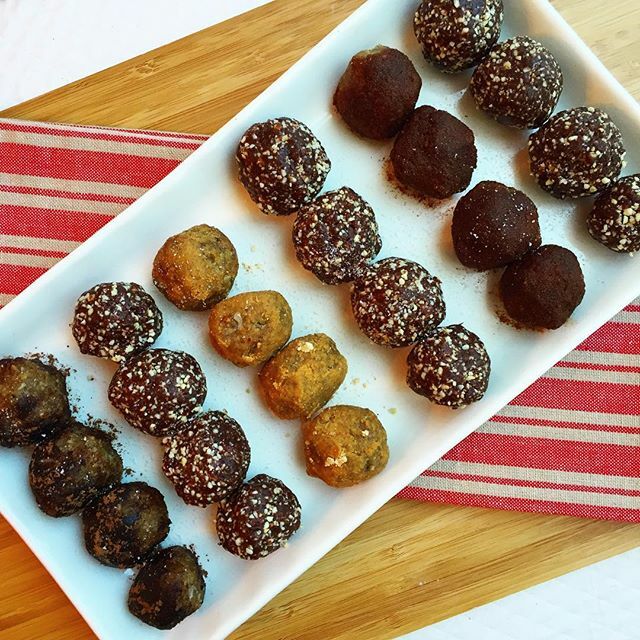 In a food processor combine: 2 cups raw & unsalted cashews, 5 large dates (remove pits), 1 heaping spoonful cocoa powder, 1 spoonful hemp hearts, 3 tbsp. agave 5 sweetener (this is the one I use because it is a low calorie and sugar free option, but you could use regular agave as well). Pulse until the mixture becomes sticky, then roll into balls and refrigerate until ready to serve! These are made with the same process..just different ingredients! 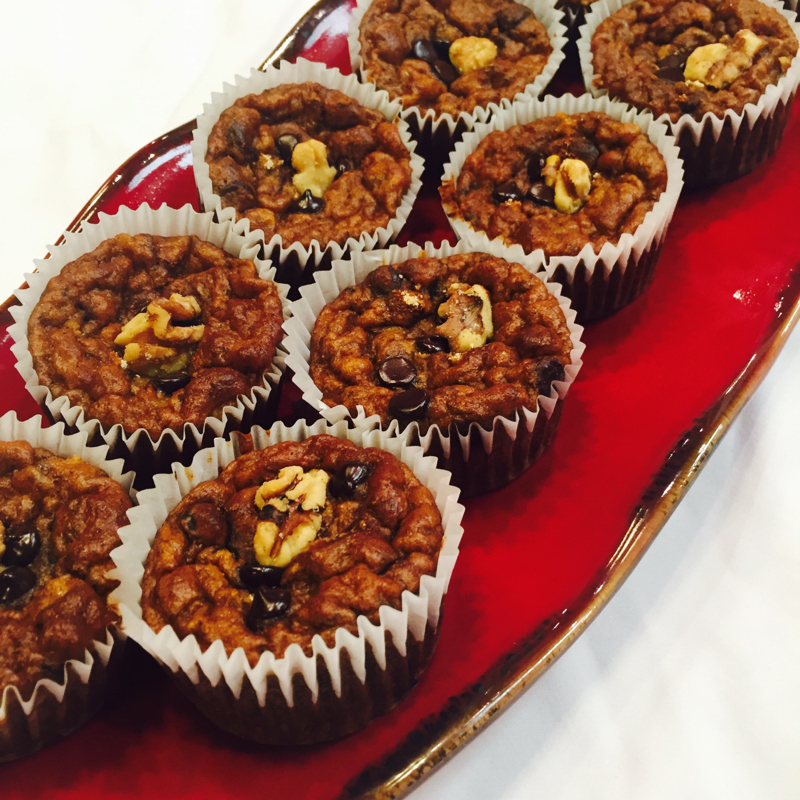 For these combine: 2 cups raw walnuts, 1/3 cup coconut flakes, 5 pitted dates, 3 tbsp. agave 5. For this version, I like to roll them in different things to sweeten up the nutty flavor a little bit. 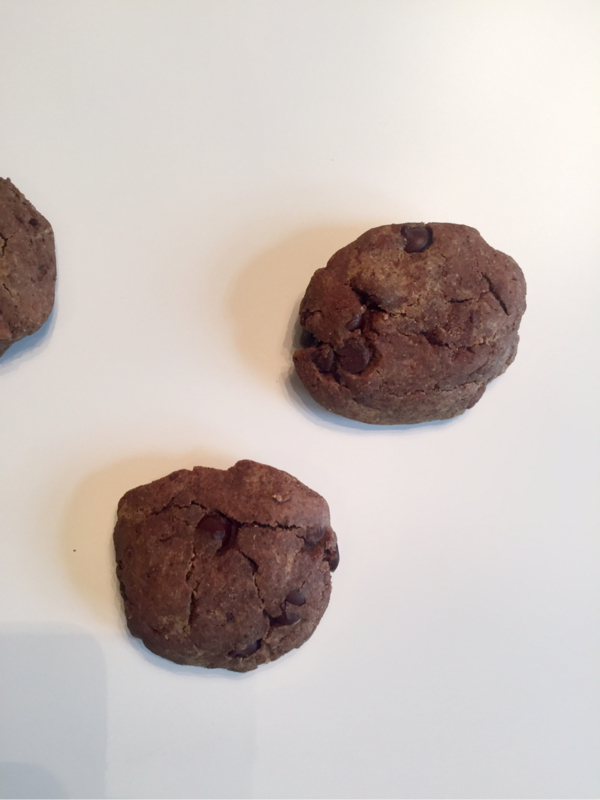 In this recipe, chose to roll them in cinnamon, carob powder, and powdered peanut butter! Well, first semester is over. And let me tell you, it flew by!! I am so excited to have a break to spend time with my friends and family back home, along with getting to spend time on things I usually don't have time for. Lots of cooking and blogging to come over the next month! One thing all students have to get through before they can start their break though...is finals. In this post, I want to talk about how I kept my energy up and stayed positive during finals week! Even though I spent hours in the library, I was able to have a surprisingly very good and not overly exhausting week. Below are just a few of the things I believe are crucial during a week full of studying in order to feel your best! As obvious as this sounds, it's easy to just grab a banana or a cheap granola bar to start your day. But let me tell you, if you don't want to run out of energy by lunch time, this is not the way to go. Starting your day with a filling and nutritious breakfast is key to boosting your energy throughout the day. One of my go to's during this week was oatmeal mixed with Nuzest pea protein powder (use my code, inspiredbysydney , for 15% off at checkout..I promise this stuff is SO good) and chia seeds. I like to top it with fruit for an energy boost as well as nut butter for a good, healthy fat serving to keep me full. Even when you just want to take the easy route, eating a well balanced breakfast will help you more than you know. I'm all about balance...trust me. Those cheat nights are a must for me to stay happy and mentally sane :) But when it comes to finals week, where you need to feel your best in order to have the energy to push through, keeping your eating as clean as possible is key. And trust me, the cravings to stress eat on pizza and pints of ice cream during finals week are so real for me too. But, in my opinion, these just bring your energy down and make you feel worse in the end. So, my tip would be save that for when your done so you can relax and know you earned that cheat meal. Well, not much else to say about this one. Snacks will be your best friend. My brain basically stops functioning after a few hours without eating, so I think it is important to always have clean, filling snacks on hand so that you can keep your brain function and energy levels at their best throughout the day. As easy as it may be to think that staying up all night studying is the best way to go, I found that getting a full night's sleep was the ONLY way I had the energy to make it through my days. Being productive, that is. When you don't get sleep, your body doesn't have any fuel to run on, which can be SO exhausting and can really effect the functioning of your brain. Also, it is important to take breaks in-between studying. Maybe treat yourself to going to dinner if you've been at the library all day. Or even if it just means getting up and taking a lap around the building, don't over exhaust yourself for studying hours and hours with no breaks. My last tip/piece of encouragement is to stay positive!! Finals are tough, but don't be too hard on yourself. Be proud of how hard you have studied and how much time you have put into trying to do your best. Even if your grade turns out to be totally not what you expected after days of studying (aka Chem for me), just know you tried your best and that's all you can do. Just move on and be proud of your hard work. Now give yourself a pat on the back. YOU'VE MADE IT THROUGH FINALS WEEK!!!! Hey there! 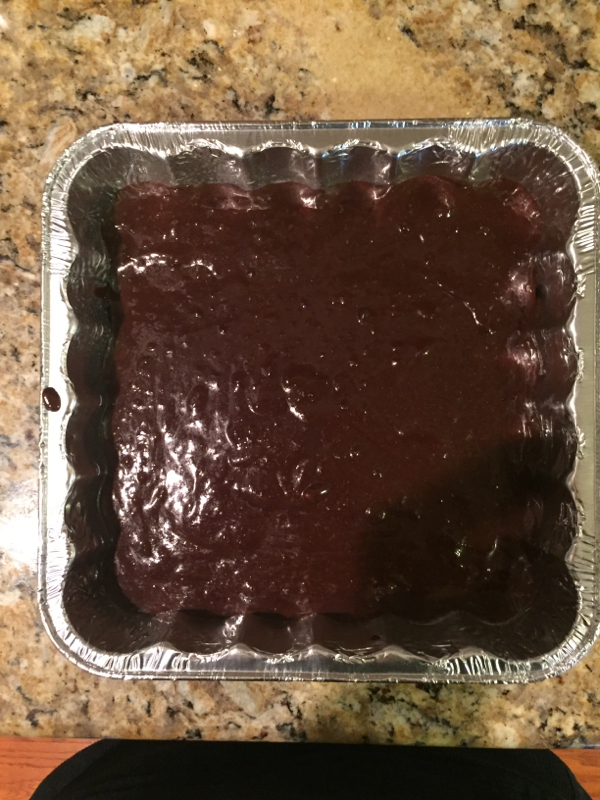 With the help of one of my friends, I have come up with a new and improved black bean brownie recipe! The texture and taste is more so like the real thing:) Give these a try and you won&apos;t regret it!! Puree black beans. Add in all other ingredients except the chocolate chips and blend until smooth. 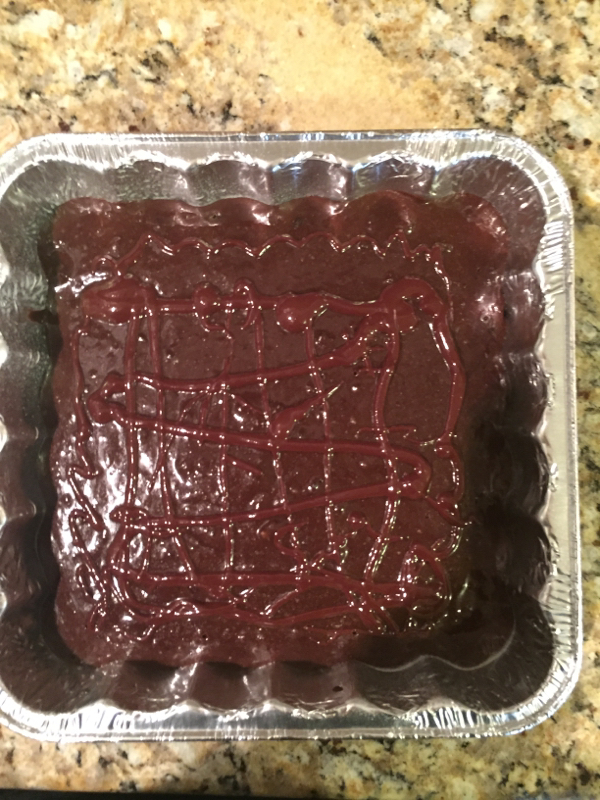 Stir in the chocolate chips and transfer batter into a square baking pan sprayed with non stick cooking spray. Top with more dark chocolate chips and bake at 350 for 30 minutes. enjoy! 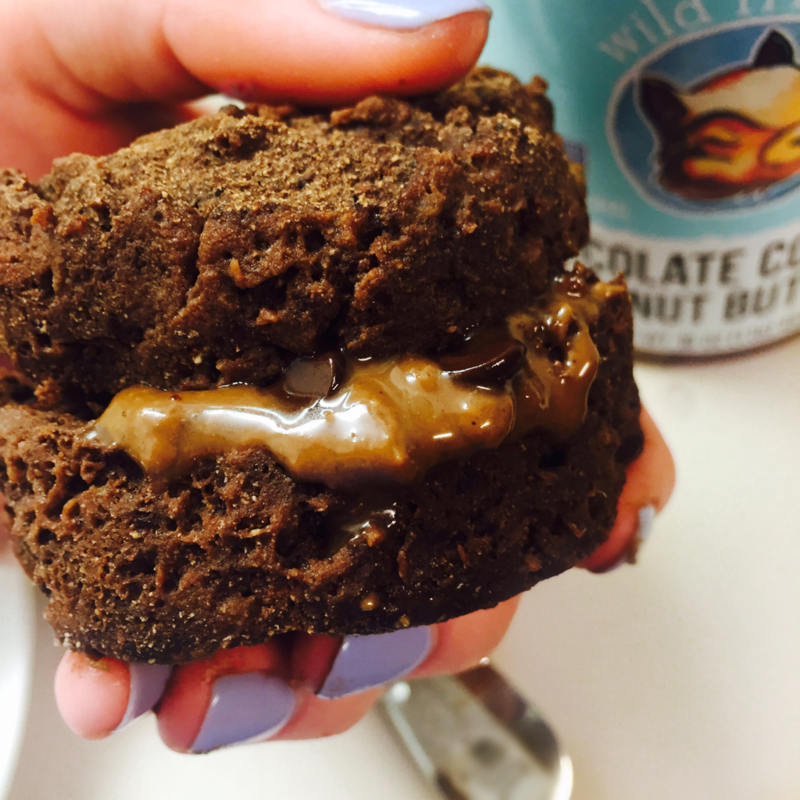 I have always loved muffins, but most muffins are full of refined sugar, butter, and oils. 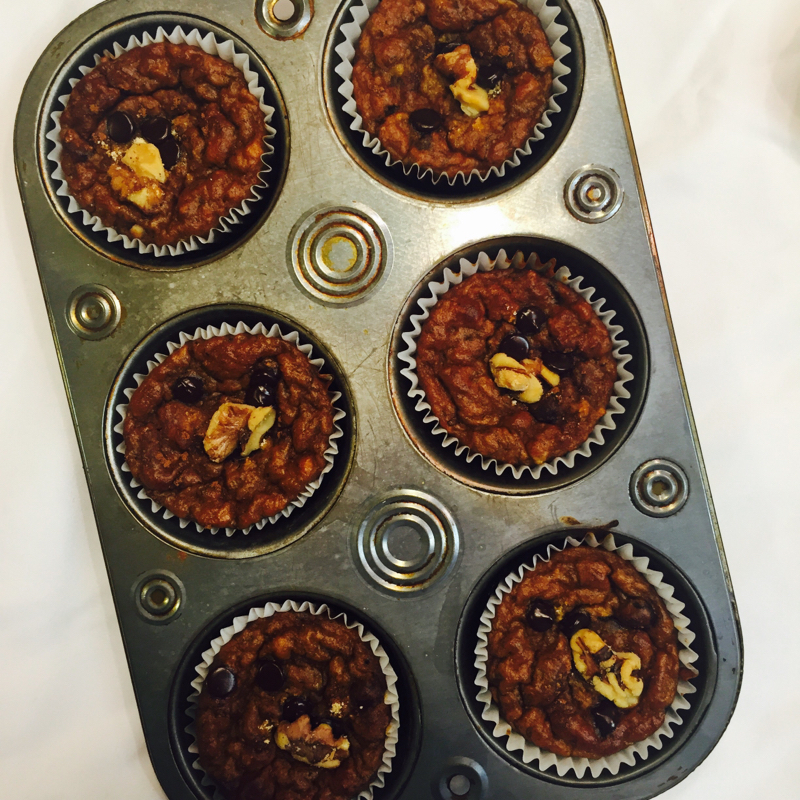 So, I whipped up this recipe for some clean muffins that taste just like the ones you may be used to. And they are prefect for the holidays! Keep scrolling to find out how. Now, place paper muffin holders into your muffin tin and scoop the batter in. This recipe should make about 12. 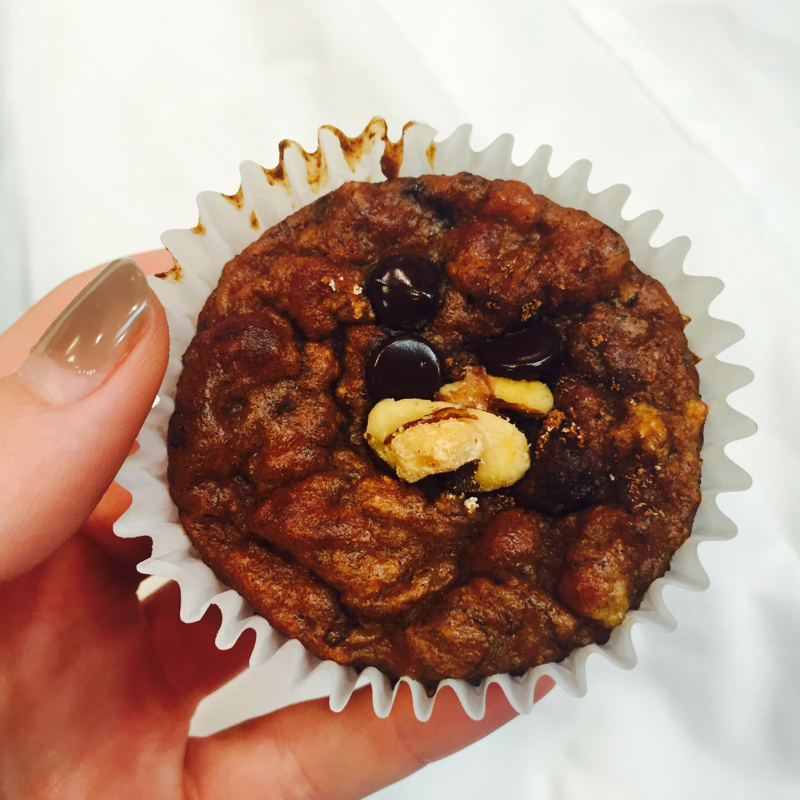 Top your muffins with a few more chocolate chips, a sprinkle of stevia and pumpkin pie spice, and a large walnut. Bake at 375 F for about 20-25 minutes. Let cool and enjoy!!! French toast...so good, but usually also so high in sugar and fat. Well not anymore! With this seasonal pumpkin French toast recipe, you don&apos;t have to feel guilty, and you won&apos;t be missing out on any flavor! Yum!! In a small bowl, whisk together equal parts egg whites, almond milk, and pumpkin. Add in a dash or two of cinnamon as well. 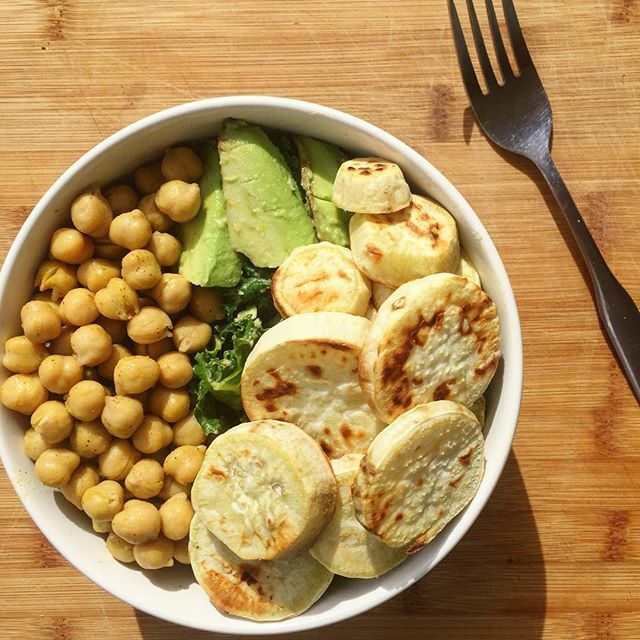 Heat up a non stick skillet pan while mixing these ingredients. Dip your toast into the wash and then place onto your cooking pan. Flip after about a minute, and let the other side cook. You know they are done when you begin to see the egg whites cooking onto the bread. Plate your French toast and top with whatever you like!! Here I topped mine with banana, pure maple syrup, cinnamon, gingerbread peanut butter, and a pumpkin spice protein bar. Hope you guys enjoy this recipe. 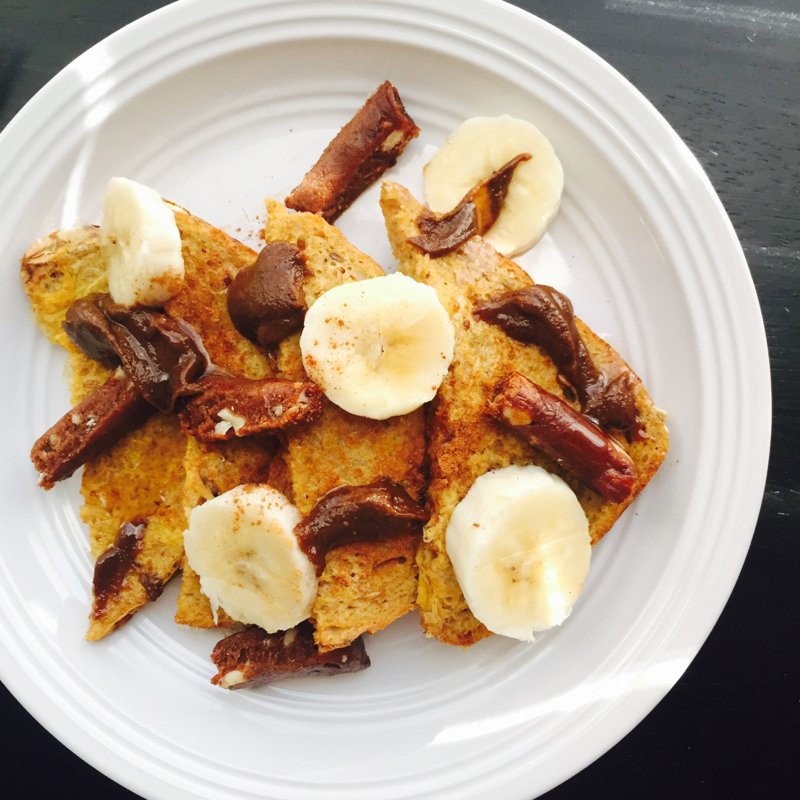 It&apos;s simple, guilt free, and who doesn&apos;t love a seasonal breakfast?!! Would love to hear thoughts if you guys try this. 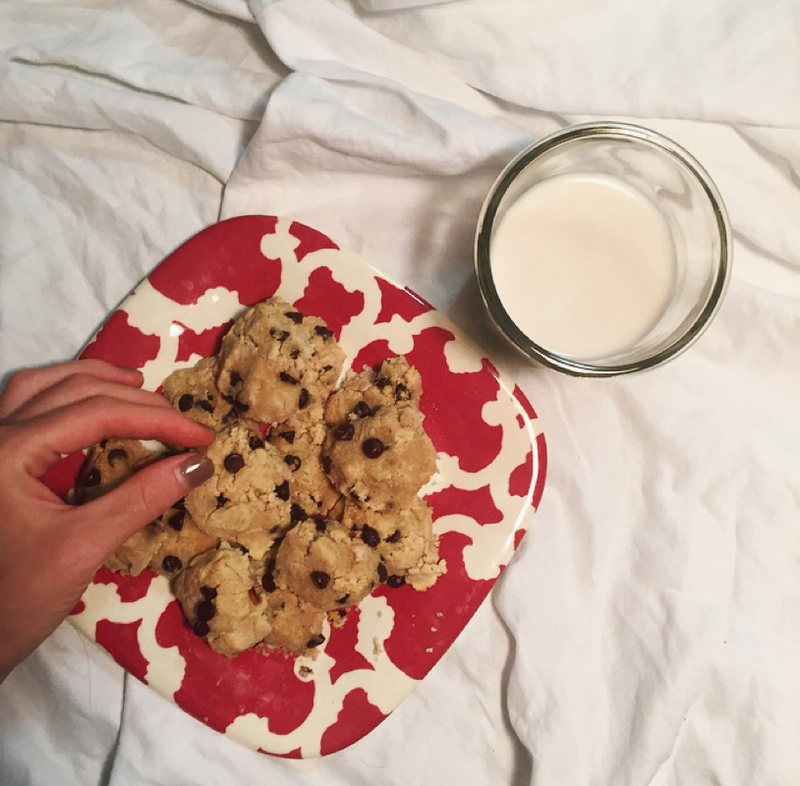 Chocolate chip cookies have always been one of my favorite desserts. When I was younger, I think me and my brother ate the whole batch the night we made them. And probably the majority of that in cookie dough...But sometimes we want to be able to enjoy our favorite treats without all the added sugar and fat. 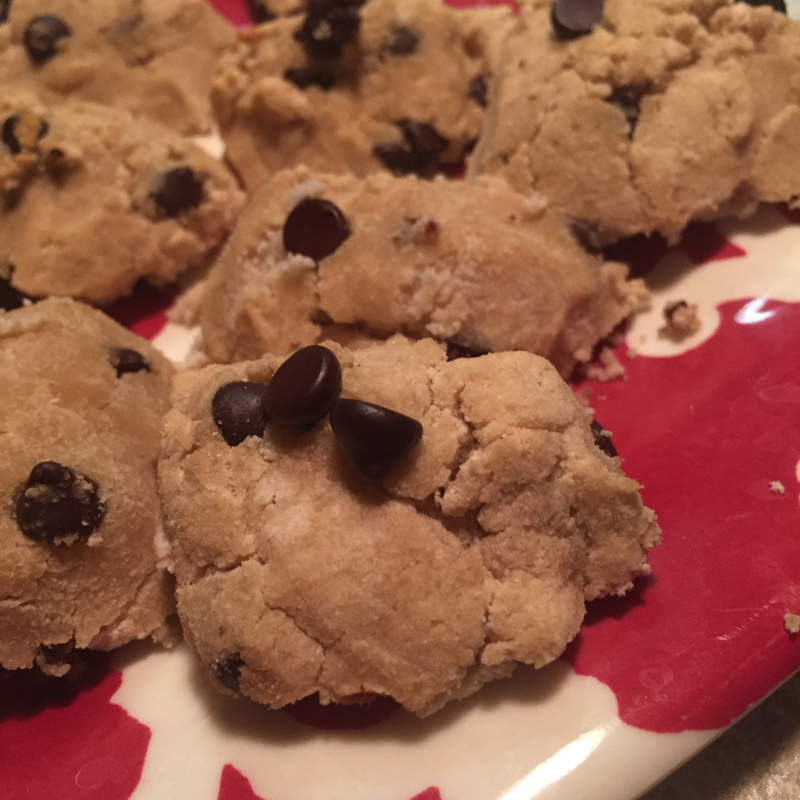 This recipe is grain free and sugar free, but still super yummy! Hope you enjoy. 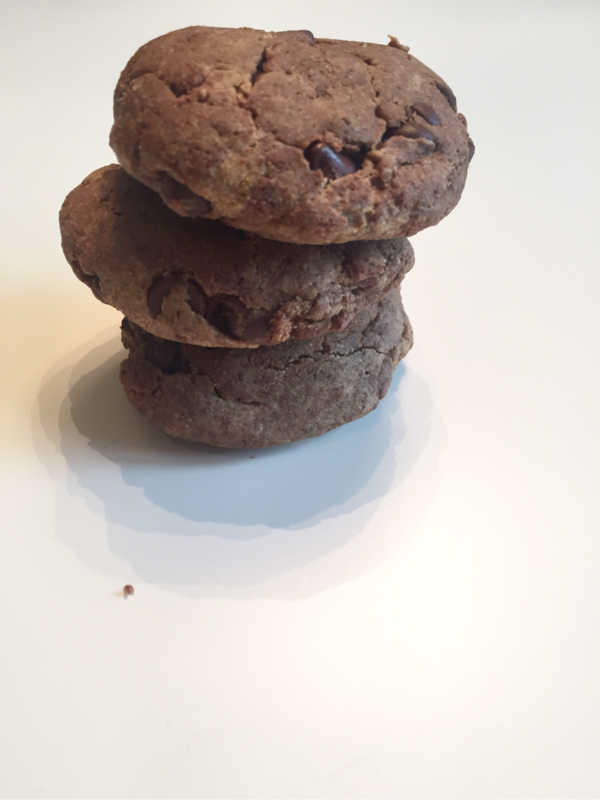 First I wanna say, the texture of these cookies are more fluffy and crumbly than your regular cookie, but the taste is on point and I will keep experimenting with textures. I thought these turned out great regardless! Mix together coconut flour, xanthan gum, baking soda, and salt. 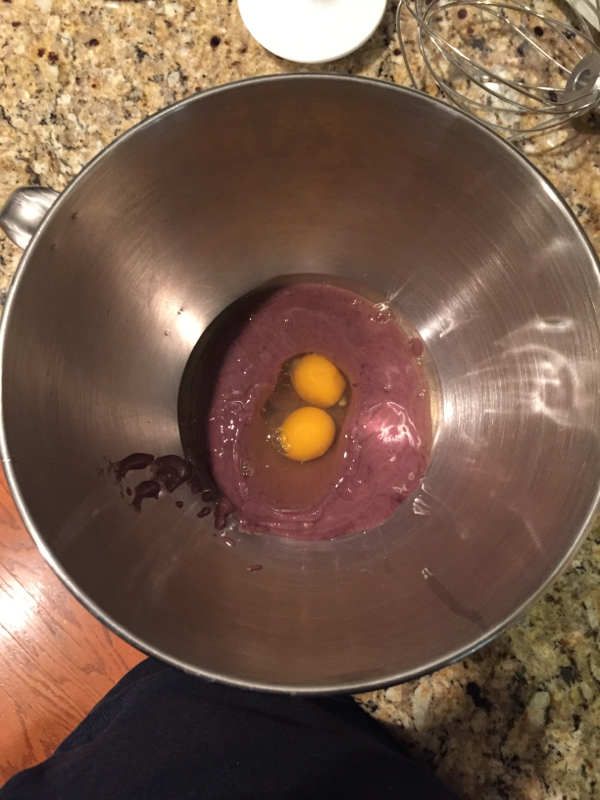 In a separate bowl, mix together the melted coconut oil, egg whites, and vanilla. Stir in stevia to this bowl, and then the milk. Add in the coconut flour mixture a little bit at a time then add your desired amount of chocolate chips. Would love feedback on what y&apos;all thought of this recipe!! Hope you enjoyed. 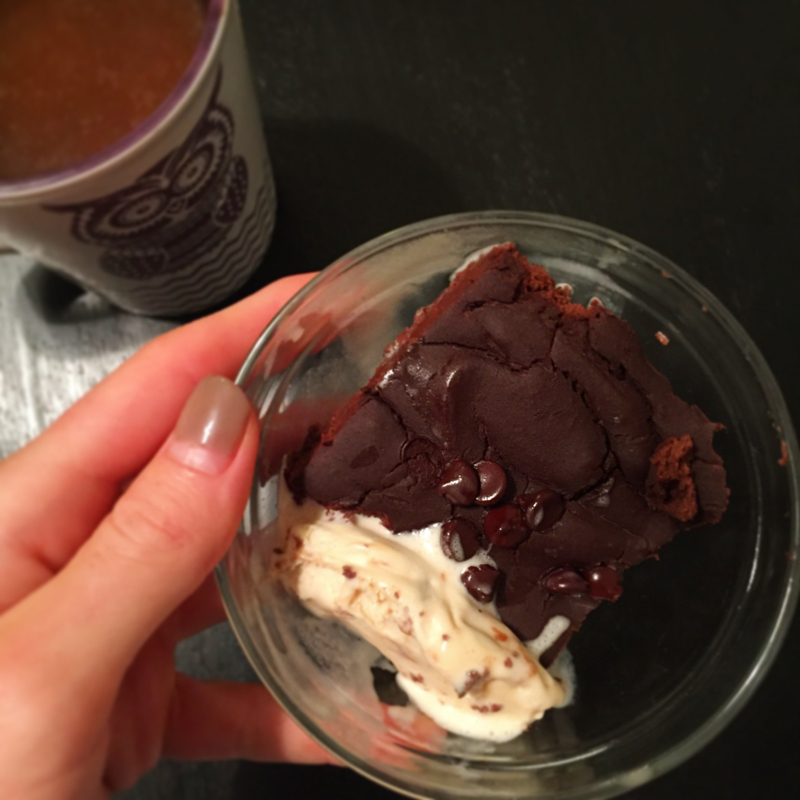 Who doesn't love a good, fudge brownie? The only problem is most times when you think brownie, you also think high fat, high sugar, and high carb. Well, not anymore! 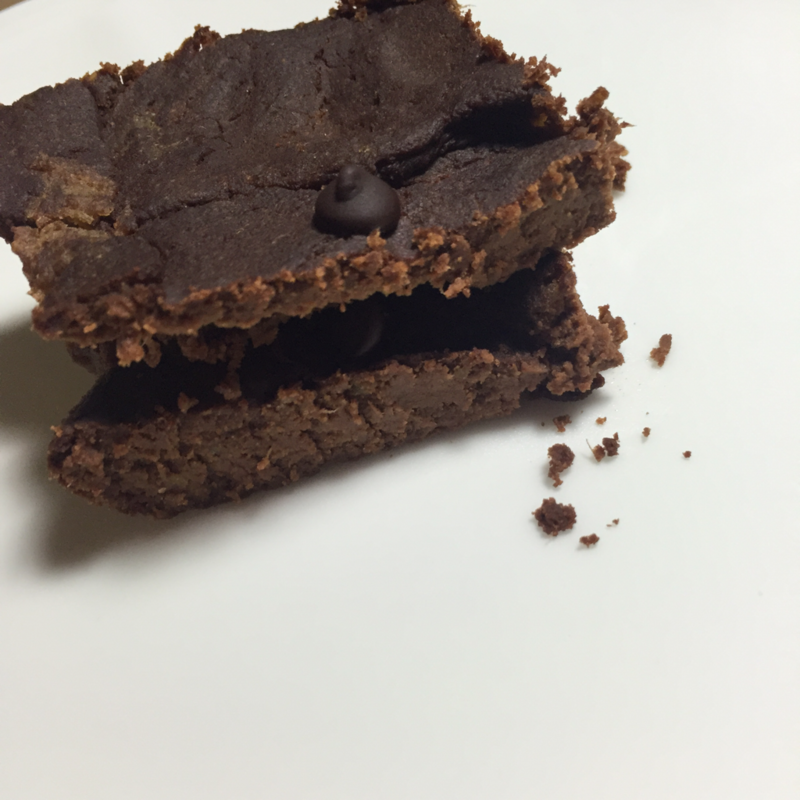 After a few rounds of trial and error, I finally came up with this completely guilt free black bean brownie recipe. It's grain free and low in sugar! You can even substitute the egg for flax egg to make it vegan friendly. Below are step by step picture instructions for how to make this yummy dessert! 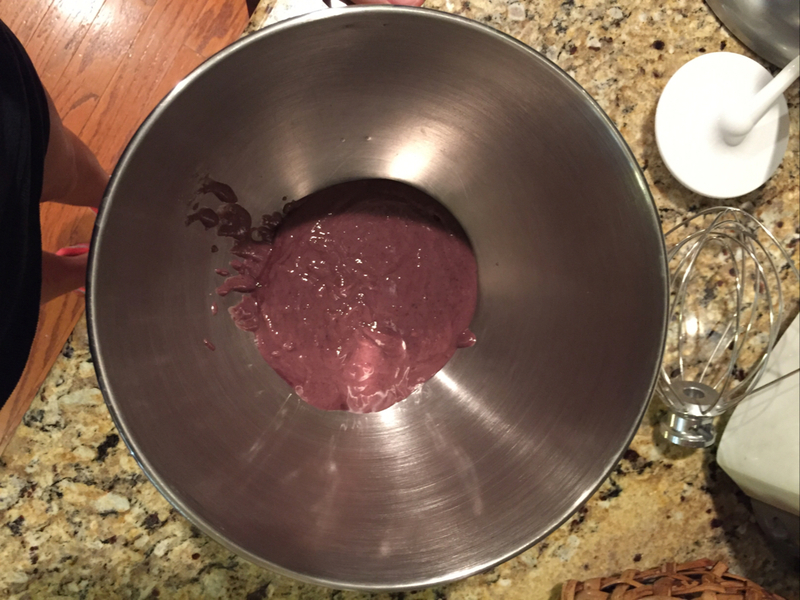 Blend black beans in a blender until there are no chunks left and transfer to mixing bowl. 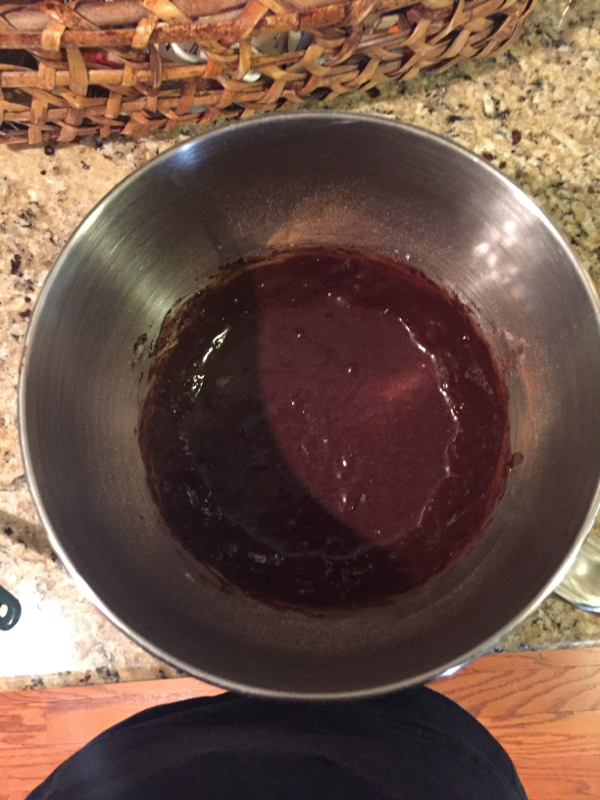 Add the rest of the ingredients into your bowl except for the dark chocolate. Blend ingredients together until a smooth chocolate texture. 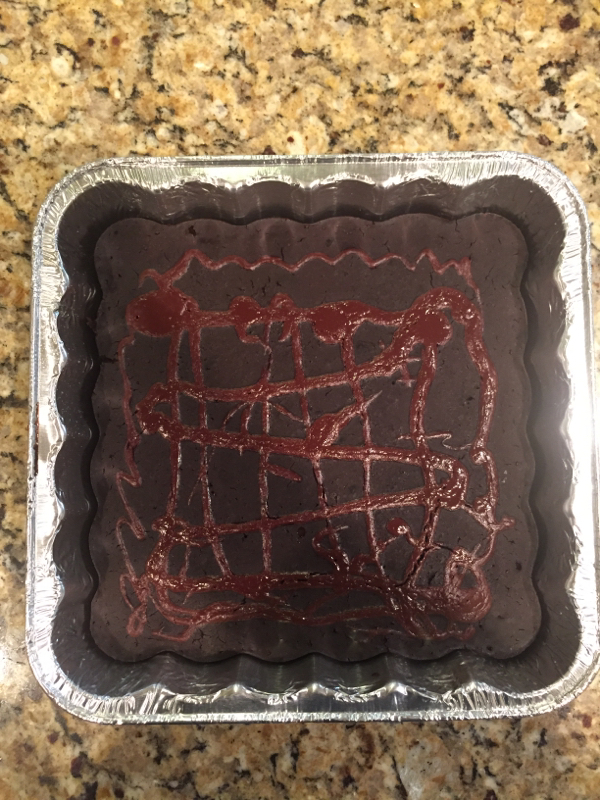 Transfer batter to a baking pan sprayed with non stick spray. Melt your dark chocolate and drizzle it over the top. Bake on the middle rack on 350 for about 20-25 minutes. It is done when the batter starts to pull away from the sides of the pan and the top is hard. Need a good side dish or just a yummy way to get your veggies? 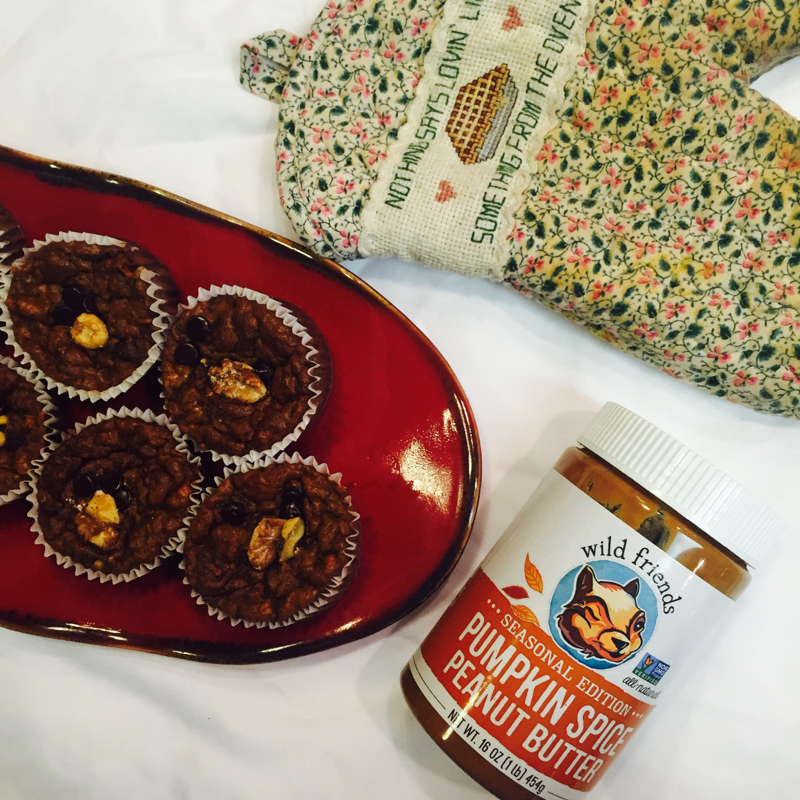 This fall inspired dish is perfect for both! Perfect combination of flavors and so many health benefits! Keep reading to learn how to make this yummy hash. Heat about 1/2 tbsp. olive oil in a non stick pan. Add in brussels, red onion, a few shakes sea salt, and black pepper. Cover on medium heat until cooked through. Add a few drops of olive oil and diced sweet potato. Stir until warm. Serve and enjoy!! Do you ever end up in a place with no gym when you're traveling or just don't feel like leaving the coziness of your home in the winter? We have all been there, but there are effective exercises that can be done with no equipment needed. Not even a mat! Here's just a few of my favorites. Burpee Pushups- Start in a standing position and drop down into a pushup. Once you have completed the full pushup motion, jump your feet back to your hand and jump up, reaching your hands to the sky. Land back in a standing position and repeat. Squat Tuck Jumps- These may be simple, but let me tell you, they are killer! Start in a standing position and squat down about half way. Explode and jump up bringing your knees as close to your chest as you can. Land back in a half squat and repeat continuously. Double Pulse Squat Jumps- Squat down to parallel, then barely come up and go back down. Next, return to standing position and repeat. Jumping Lunges- Start in a lunge position. Lunge and explode up switching which foot is in front while in the air. Land in the lunge position and explode and switch legs again. Repeat continuously. Planks- Planks are great for your core and can be done anywhere. Hold the plank position forwards and to both sides and be sure to do it for a challenging amount of time. Single leg hip raises- Lay on your back, raising your hips to the sky. Lift and straighten one leg, then lower and raise your hips continuously. Alternate legs and repeat. Snap Jumps- Start in a pushup position. Jump both feet up to your chest then back. Repeat continuously. I also like to do these where I jump my legs to alternating sides. Tricep Pushups- Start in a pushup position (it's okay to get on your knees! if you can't do the full motion, don't risk injuring yourself and modify it). Keeping your elbows all the way in by your body, perform the full pushup motion and repeat. The key is to not let your elbows flare out so that it works the triceps. X-Mountain Climbers- Start in a pushup position. Quickly bring your knee to the alternating side of you body and switch. Continue alternating legs and be sure to go quickly, almost like you are running. Side Sumo Crab Walk- Start by standing in a low sumo squat position (wide feet and toes pointed outwards). Staying in a low squat, step your foot to the side and follow with your other foot. Continue doing this continuously while staying low, then repeat going the opposite direction. Hope these will be useful to you guys! Stay motivated and keep pushing. You got this! This blog post is titled top things to keep in your dorm, but this really applies to anyone no matter where you live! It can be hard to know what foods to eat when or what foods you should get at the store. Below, I will list 10 foods I think are important to always have around to help you stay on track. A Variety of Fruit- Always keep a variety of fruit handy, such as bananas, strawberries, apples, dried figs, grapes, etc. These are great for an extra boost with your breakfast in the morning, for smoothies, or just to grab when you may be craving something sweet. Avocados (yes, these are a fruit), are also full of great, healthy fats that our bodies love. Fruit is also loaded with vitamins, fiber, and antioxidants, so it's a great snack to have and it's easy to take on the go! A Variety of Veggies- Like you have always heard, and the rule I will always follow, eat the rainbow! Try to keep a variety of veggies available. If you aren't sure, just get a variety of colors. For example: dark greens (broccoli, spinach, kale, brussel sprouts, etc. ), squash varieties, cucumber, carrots(and hummus for dipping), and sweet potatoes. These can all be easily steamed in the microwave if you don't have access to an oven. Clean Snack Bars- As much as I love making my foods from single, whole ingredients, we all need quick and on the go snacks sometimes. Keeping bars with clean ingredients around that you can take will stop you from grabbing that processed snack at the nearest shop in the middle of the day. Some of my favorites are lara bars, kind bars, yup bars, rx bars, that's it fruit bars, and macro bars. There are many more as well. You just have to check your ingredients! Popcorn- I love keeping popcorn in my dorm because it's great for when I'm craving salty junk food. Be sure to pick a pop corn that doesn't have added unnecassary ingredients and sugar. I love skinny pop and angle's boom chicka pop. You can also always make your own with popcorn kernels, seasonings, olive oil, and a paper sack in the microwave. Easy as that! Variety of Whole Grains- I like to keep a variety of grains in my dorm so I don't miss out on the amazing benefits that whole grains give us. Also, these are great sources of complex carbs. Oats are great to have handy as they can be made into a filling and quick breakfast in the morning. They have lots of fiber and are great for the heart. You can also keep things like steam able rice bags, brown rice cakes, whole grain toast, whole grain cereal and crackers, etc. available for good sources of whole grains throughout your day. Seeds, Nuts, and Nut Butters- These are great to keep on hand to throw into your snacks or mix with your oats in the morning. They are great sources of the healthy fats our bodies need and have a good amount of protein to step up your snack or breakfast a little bit! Variety of Protein Sources- Protein is so important in keeping your muscles strong and in making progress with your workouts. Be sure to always get plenty with your meals. I like to keep a few different sources that I can use throughout the week. For example: egg whites (great in oats, mug cakes, or just alone), yogurt, chicken, salmon, and turkey. I also try to get a lot of my protein from plant based sources (I have been doing this for a few months now and have really seen a positive difference) such as meat free chicken and other 'meats', tempeh, and legumes. Another thing I like to keep on hand is protein powder. It's great for oats and smoothies! 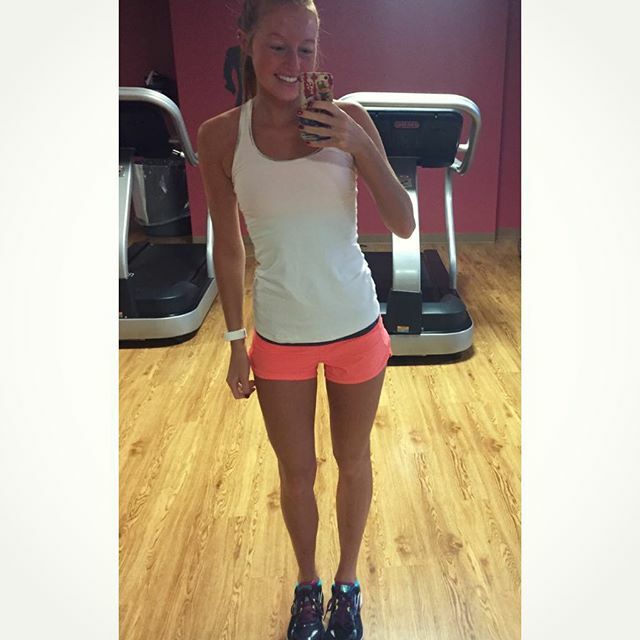 A Happy Attitude- As cheesy as this may sound, and I know it's not a food, it is so important for staying on track! In order to stay on track, you have to have the right attitude going through life. Stay motivated, but don't get down on yourself when you mess up or have off days. It happens to everyone! Remember to find YOUR happy and love what you do. It's important to remember why you are choosing this lifestyle and to always stay positive. NOT junk food- Tricked ya! If you wanna stay on track, one of my biggest tips is to NOT keep junk food in your room (or house). If it isn't there, then you can't eat it! Keep clean snacks, and lots of fresh fruits and veggies on hand instead. Save the junk for those cheat nights or when you just wanna go enjoy a dinner with friends not worrying about food. You will appreciate it more if you don't allow yourself to constantly be surrounded by it. You're eating your veggies. You're getting your cardio in. You aren't cheating. So, why aren't you making progress?! Here I share some common bad habits I see all the time that greatly impact your progress, whether it be weight loss or just toning up. Most people don't even realize what they are doing may be the reason they aren't getting the results they want! I picked the 5 most common that I see almost everyday. Keep reading to find out what might be slowing you down! 1) You are skipping breakfast. 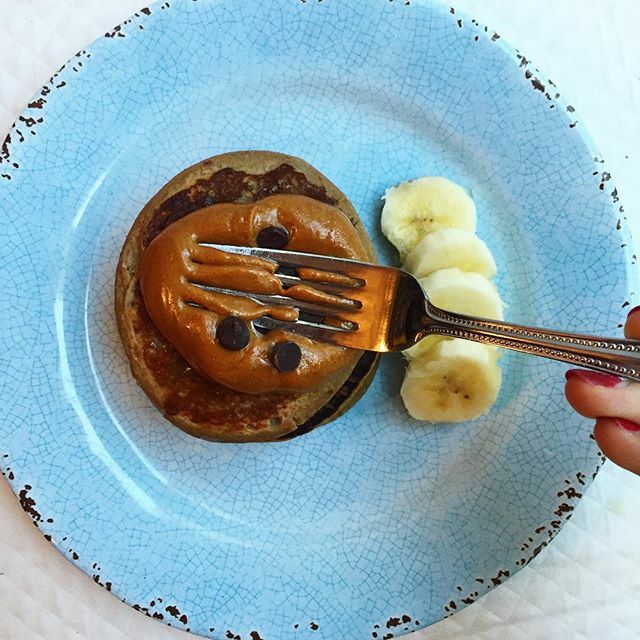 You've heard it...breakfast is the most important meal of the day. But is that really true? Well, in my opinion, yes! You may think skipping breakfast is saving you calories or making you eat less in a day, but really it's just harming your results. Breakfast is what kick starts your metabolism and gives you the energy to start your day. Your body has been fasting for probably over 7 hours, and it needs to be fueled. Eating a well balanced breakfast will also keep you full until your next meal and won't leave you feeling tired and hungry. It will keep you from grabbing that bag of chips an hour before lunch just because your stomach was growling. The benefits of eating breakfast far outweigh saving a few calories. And on top of that, why 'save' those calories. Your body needs them to fuel you throughout the day. 2) You aren't getting enough protein with each meal. Protein is essential to building muscle and keeping our bodies healthy. When you exercise, your body breaks down muscle before it builds it back up. Protein is what helps our bodies rebuild those muscles. So, if you aren't getting enough protein, your body can't build those muscles as quickly. Protein also makes you feel full and satisfied at meals, preventing mindless snacking later on. Be sure you are choosing high quality proteins rather than just thinking a spoonful of peanut butter on your toast is enough protein for your breakfast. 3) You aren't getting enough sleep. Our bodies need plenty of sleep. It is what gives us energy for the next day. If you are tired all the time, you will not be able to put as much effort into your workouts and your attitude will probably not be very good overall. It has also been shown that when people do not get enough sleep, their body craves more snacks and junk food to make them feel better. 4) You are overdoing the cardio. While cardio is good and healthy in moderation, it is very easy to overdo it. You may wonder why you aren't seeing progress when your doing 30 minutes of cardio everyday. The truth is, we do not need this much and it can actually just harm our results. All cardio and no weights doesn't give our muscles a chance to really grow. Cardio is very tiring and harsh on our muscles and can eventually cause them to break down if not paired with proper weight training and other exercise techniques. Believe it or not, overdoing cardio can actually slow down your metabolism and cause issues with heart rate. So, do cardio in moderation, and be sure to have other forms of exercise as well. 5) You are avoiding carbs. Carbs are given such a bad rep. in today's world. Don't listen to what people say about them! Carbs are so good for our bodies and in my opinion, should take up most of the calories that we eat. It does matter what kind of carbs you choose, but when you choose complex carbs, fruits, veggies, and whole grains, they provide you with so many benefits and are full of fiber. This macronutrient is what provides our bodies with energy and replenishes our glycogen storage levels. Diets high in carbs have actually been shown to help prevent weight gain. So, in short, don't be scared of carbs. Contrary to what you may think, these are actually crucial for your progress! hope you learned something from this, xoxo, you got this girls!